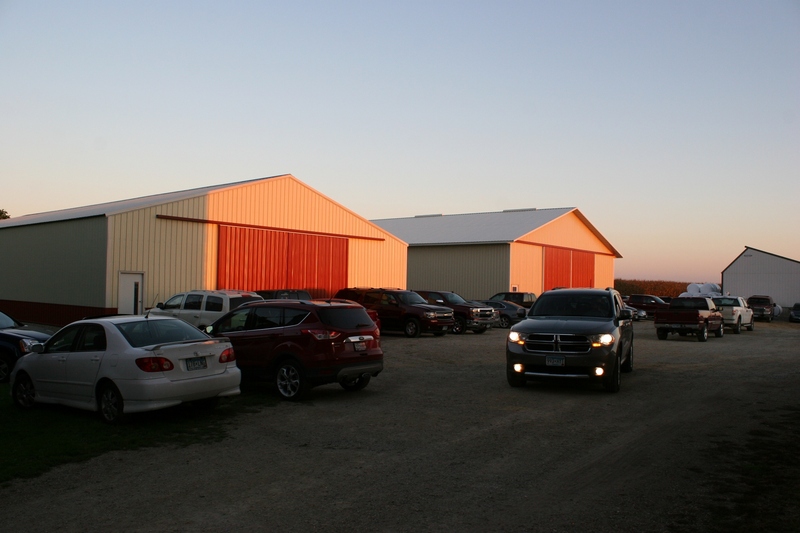 The sun sets behind John and Debbie Becker’s rural Dundas, Minnesota, barn on the evening of their September 26 barn dance. THRICE NOW I’VE DOCUMENTED dances in the Becker Farms barn. And what an honor it has been to photograph these 2011, 2012 and now 2015 celebrations in such a bucolic rural setting in southeastern Minnesota. I delight in photos, which combined with words, write family and personal histories. 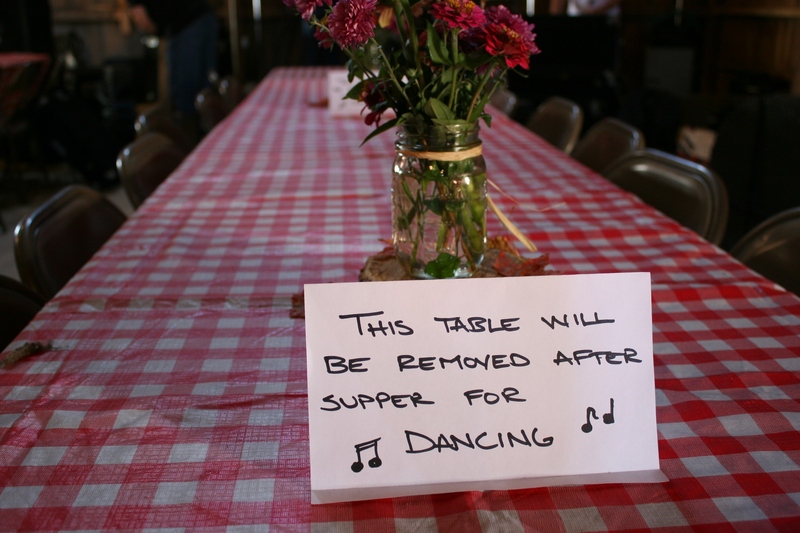 After guests ate, several tables were removed for dancing. I probably will never visit our nation’s capitol or see the Pacific Ocean or tour the Rockefeller Estate or attend a Broadway play or study a Van Gogh painting. But that’s OK. 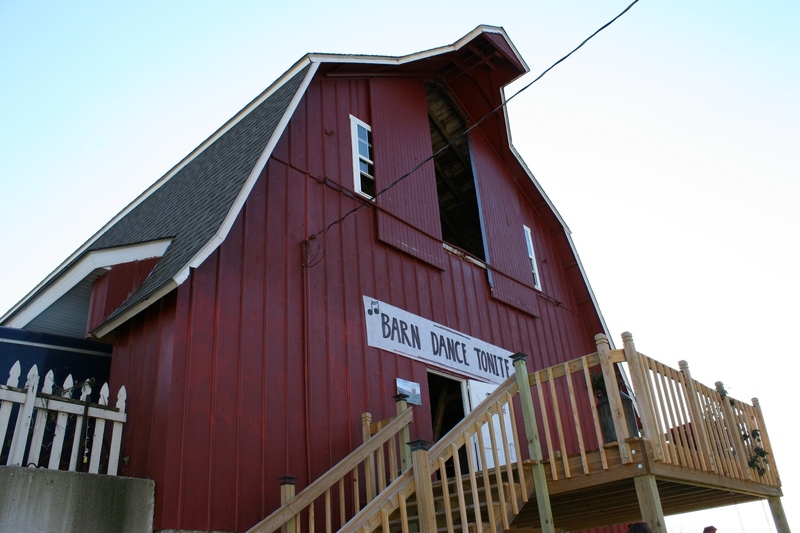 I have danced in a barn, something few Baby Boomers likely have done. I can write “Danced in a Barn” in my life’s story. 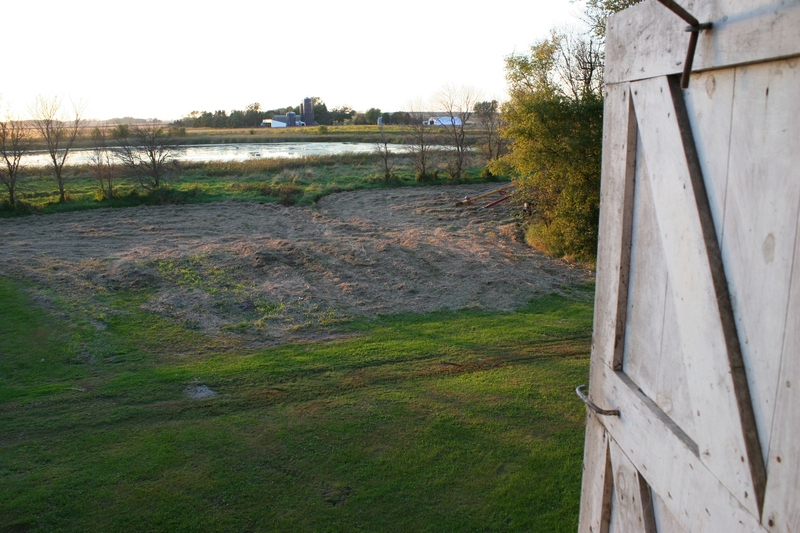 Peering out a hayloft door, I shot this scene of a pond and neighboring farm place. 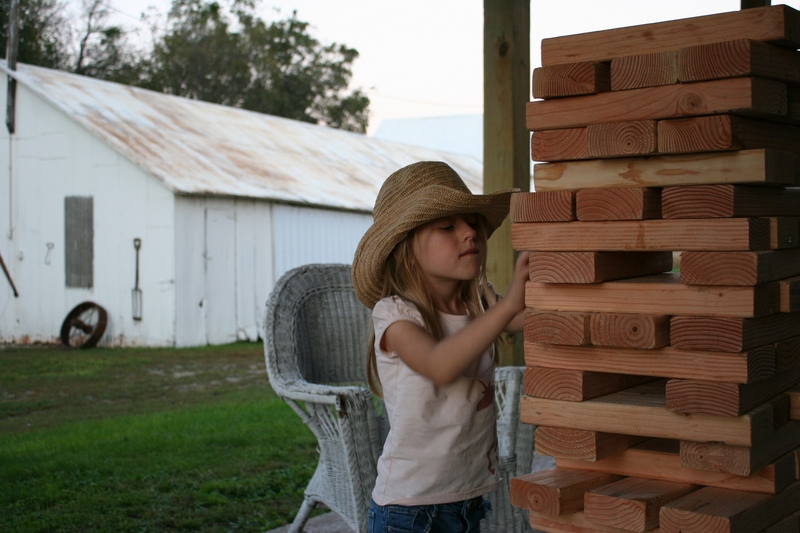 Playing with the rural version of Jenga blocks. I appreciate the simple things in life. Sun setting. Great conversation and good music. Satisfying food that’s tasty and uncomplicated. Joy that comes from watching children at play, realizing too many years have passed since I was a kid free-ranging on the farm. 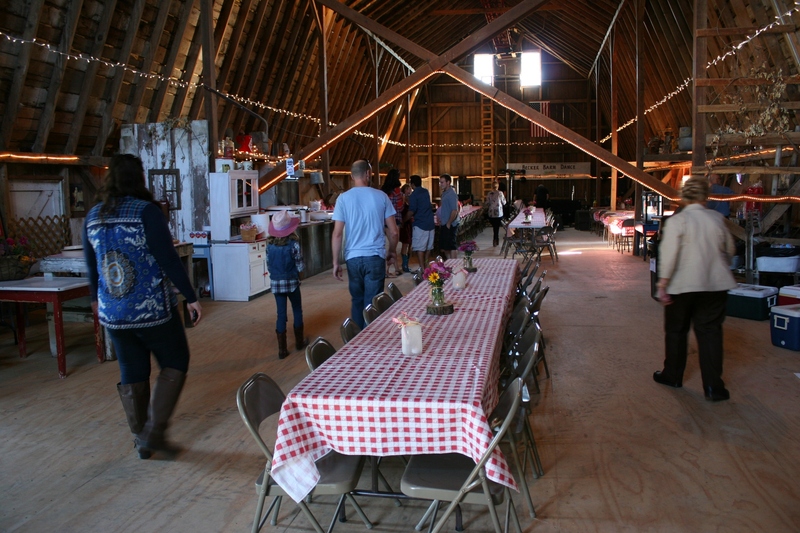 To my friends John and Debbie Becker, I am grateful for the chances to dance in their 100-year-old barn, to witness the coming together of family and friends in a hayloft. 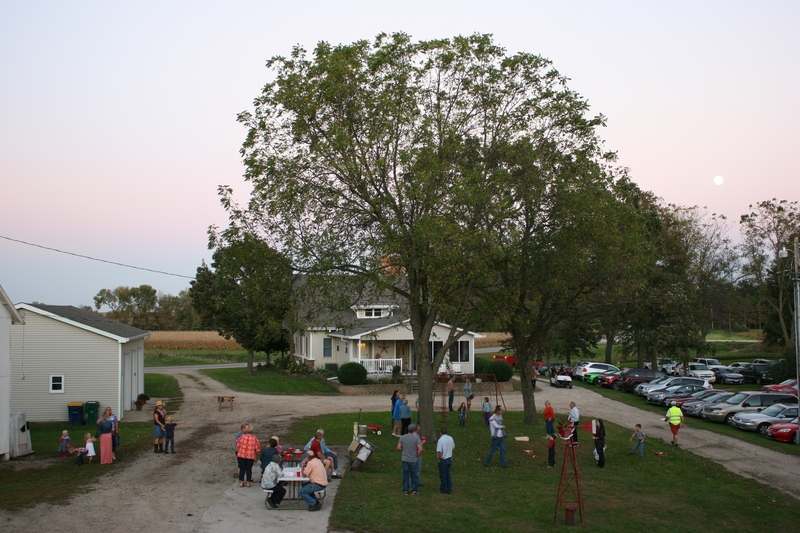 Guests gathered inside and out on a lovely September evening. 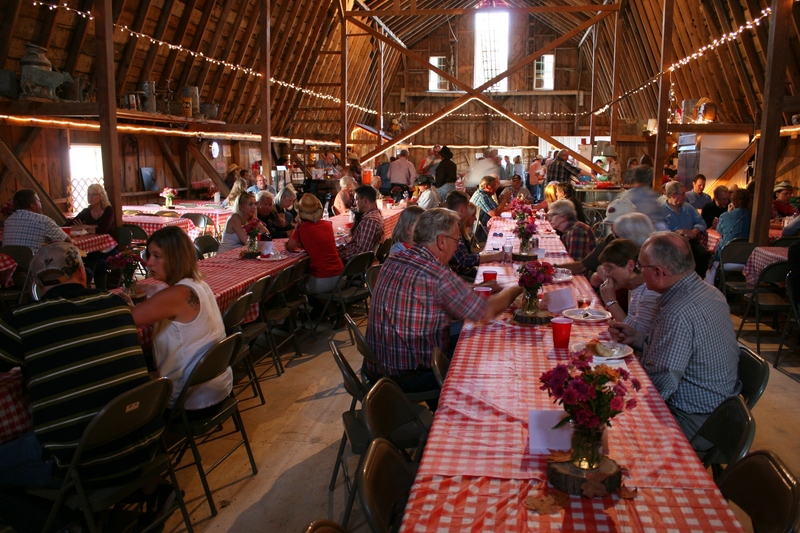 There’s something about a barn dance that roots to the rural past in a way that no museum can. As I danced, I could imagine the dances of yesteryear, hayloft empty of loose hay, eager young men and anxious young women eyeing each other from opposite sides of the loft. I could imagine food spread across planks, the scent of animals below mingling with the smell of fried chicken. Parking vehicles was a major job considering the hundreds of invited guests. 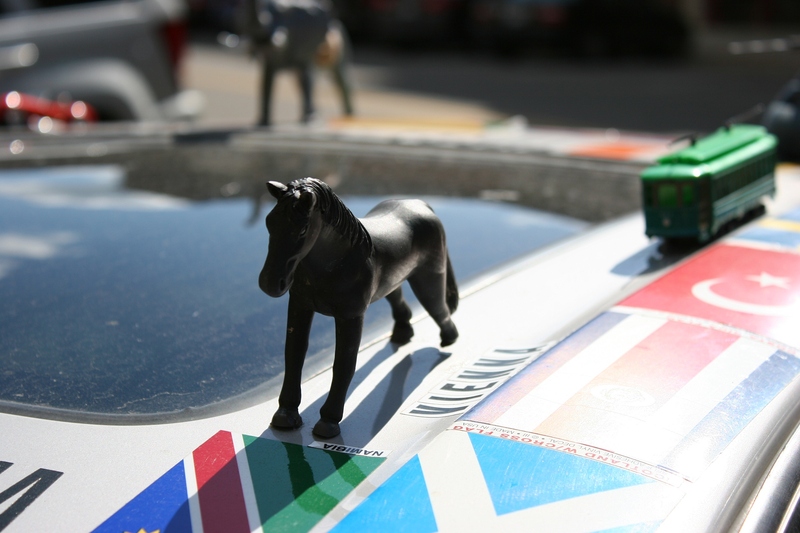 And outside, horses tethered rather than vehicles parked. 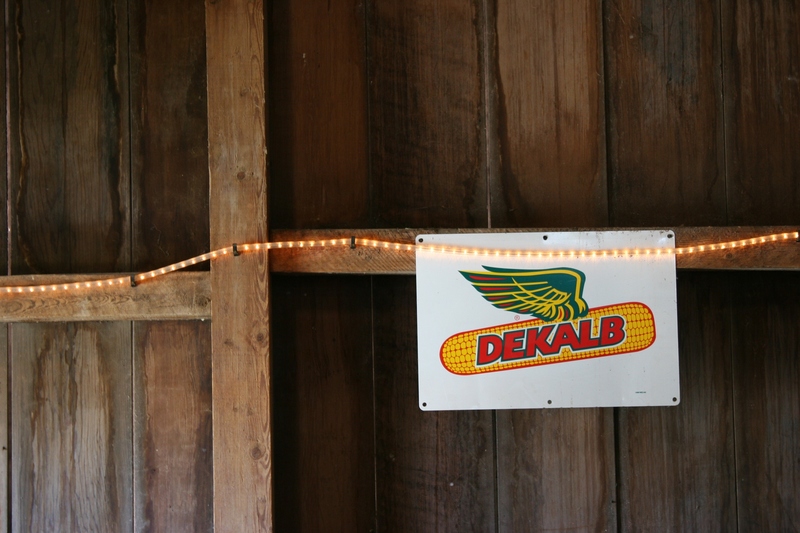 Even this Dekalb sign inside the barn generated memories of Dekalb corn growing in my dad’s fields and me detasseling corn for this seed company. 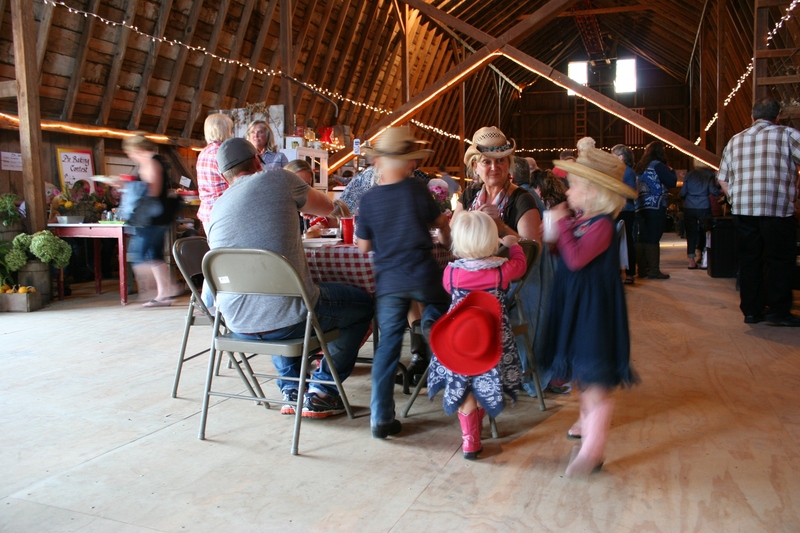 Grandparents build memories with grandchildren at the barn dance. 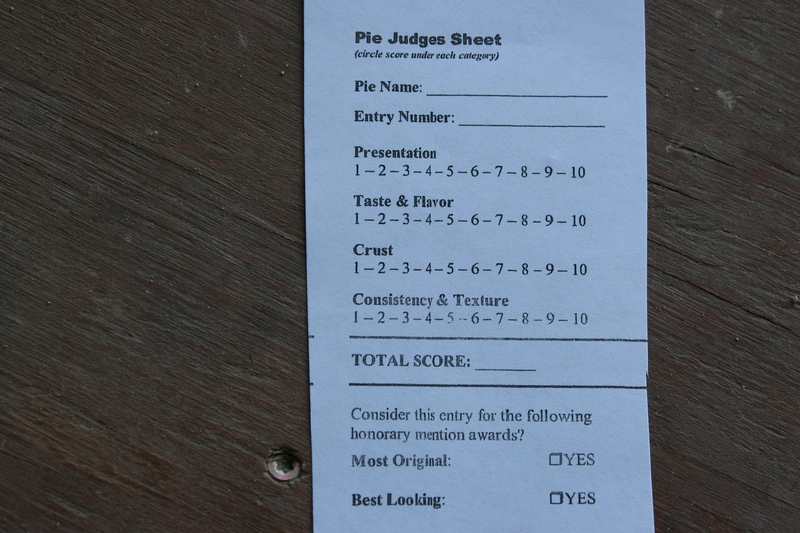 I’m sure the four judges will always remember the difficulty of choosing winners in the homemade pie baking contest. 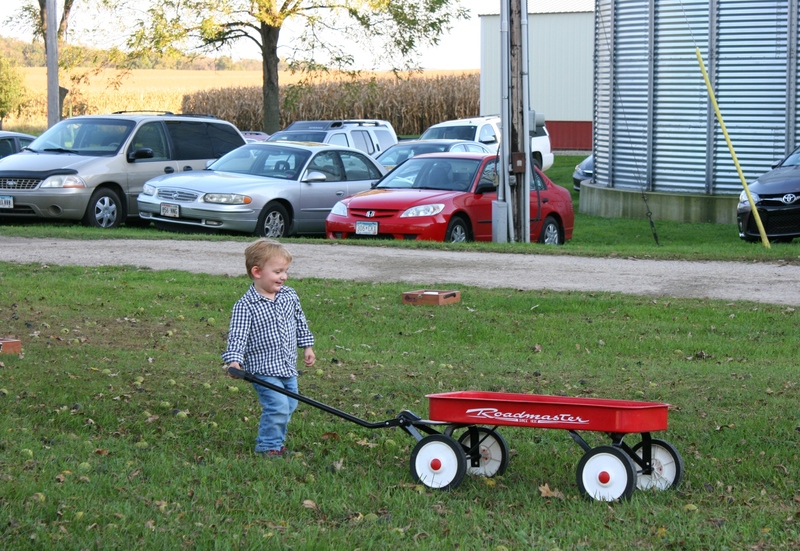 Red wagons hold timeless universal appeal to kids. 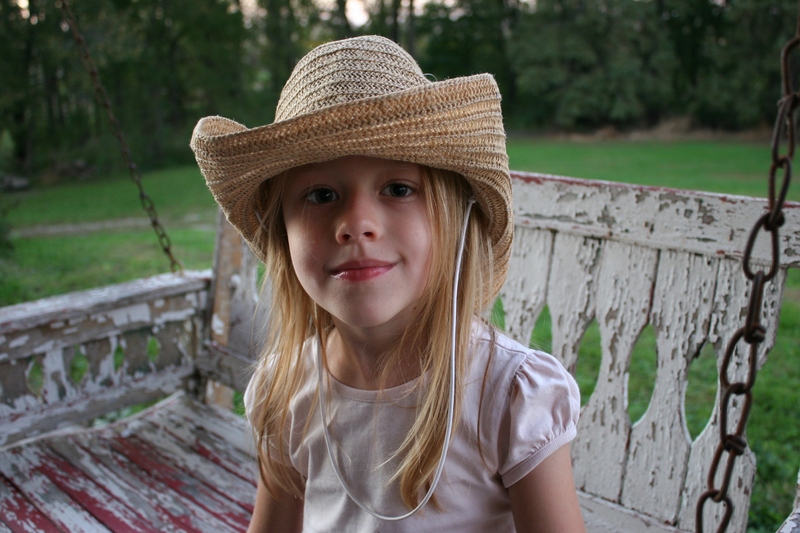 This girl’s cowgirl hat reminds me of the straw hats I wore while playing make-believe as a child. 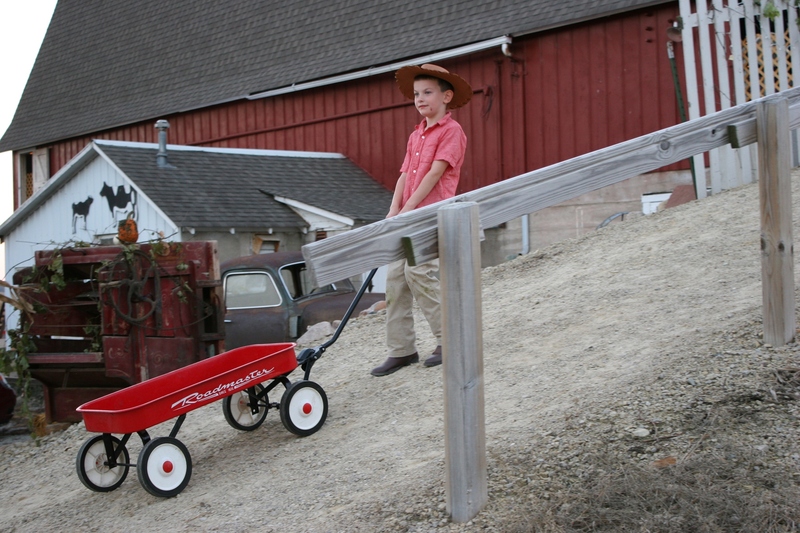 As this boy pulled a wagon up the incline toward the hayloft, I wondered if he would climb aboard for a wild ride down. Instead, he released the wagon. I would have careened down, gripping the handle. Whether my imagination matches historic reality, I am unsure. But I am certain of one thing. 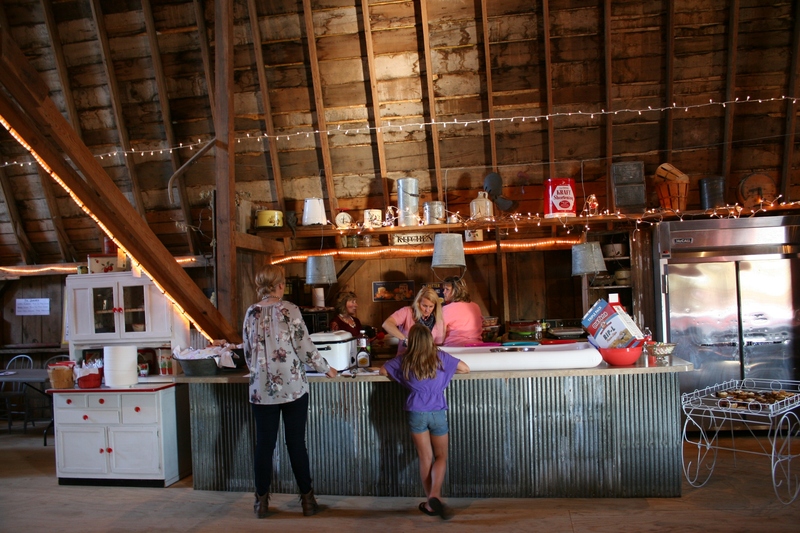 A barn dance connects folks to the past in a profound way. 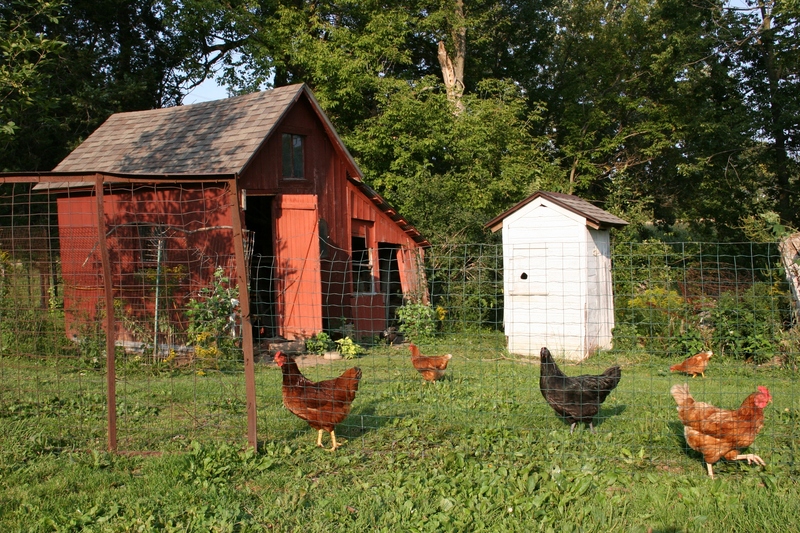 I am always comfortably at home on a farm like the Beckers’ farm site. For me, a woman from the land, dancing in a hayloft fits me better than gliding across the smoothest of floors in an elegant ballroom. I am comfortably at home in a barn, in a way that’s sweetly familiar. Connected to my rural Minnesota prairie roots. 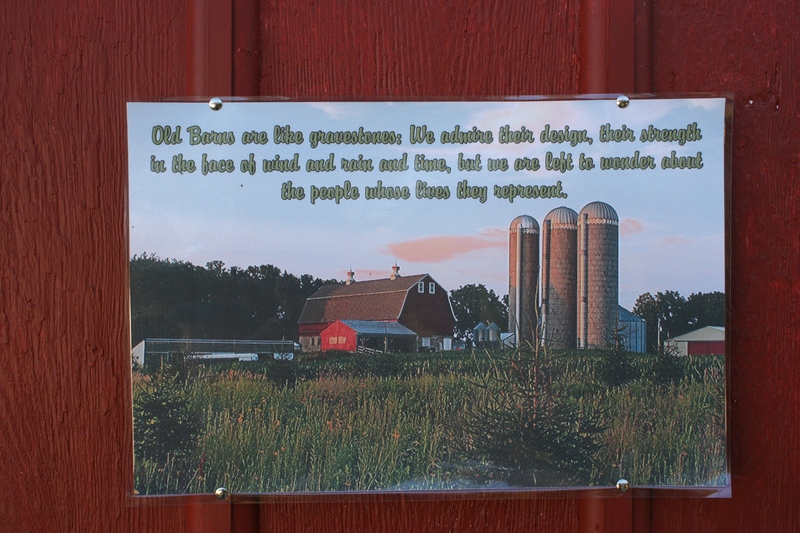 FYI: Click here and here to read my previous posts on the September 26 barn dance in rural Rice County, Minnesota. 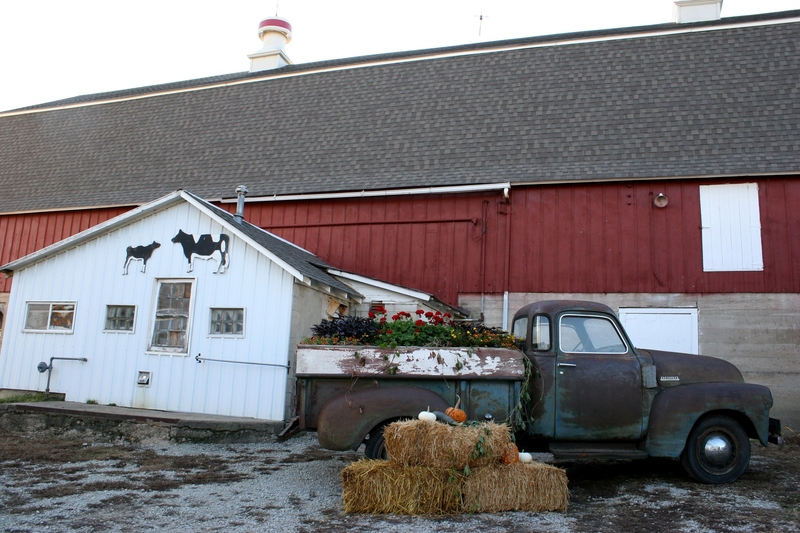 An inviting scene staged next to the barn and attached milkhouse. FROM THE MINUTE I received a verbal invitation to the barn dance, I noted the event on the September 26 square of my kitchen calendar. 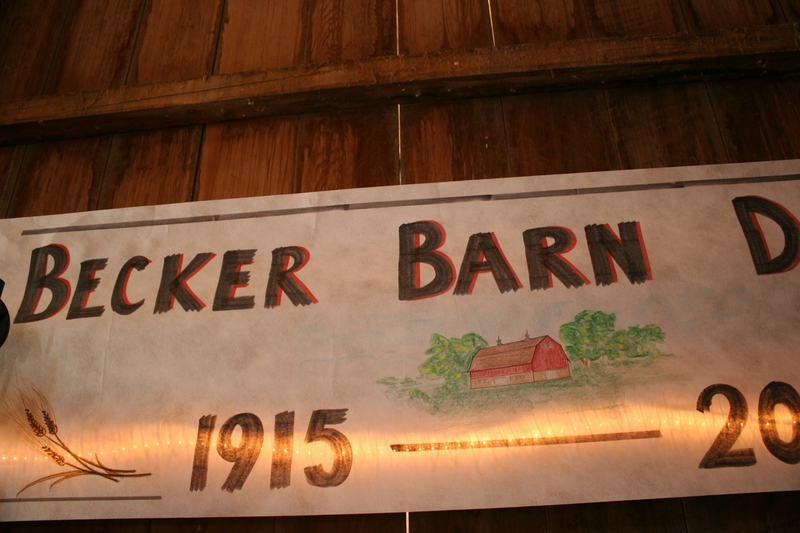 Not only would I be celebrating the 100th birthday of the Becker family barn. But I would also be celebrating my birthday. How sweet is that? 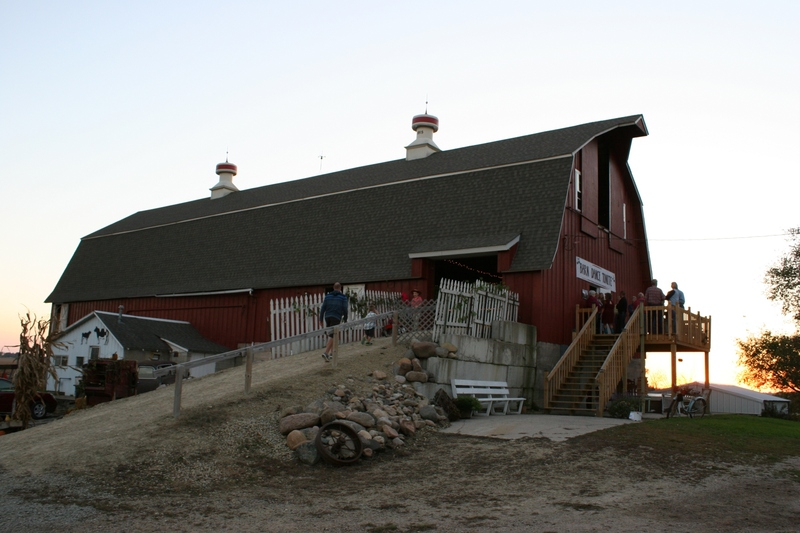 With my deep rural Minnesota roots and appreciation for aged barns restored and maintained, this party suited me. Hosts John and Debbie Becker, Rice County crop farmers, are dear friends, a salt-of-the earth couple who cherish faith, family and farming. Guests pulled up to tables and dined on hot beef and pork sandwiches, salads and more. 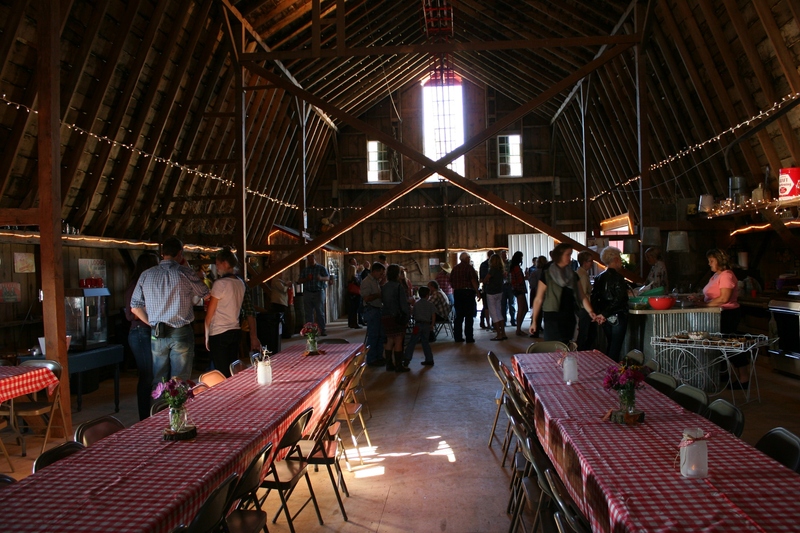 And they know how to throw one heck of a party in their 100-year-old barn, in the Becker family since 1948. 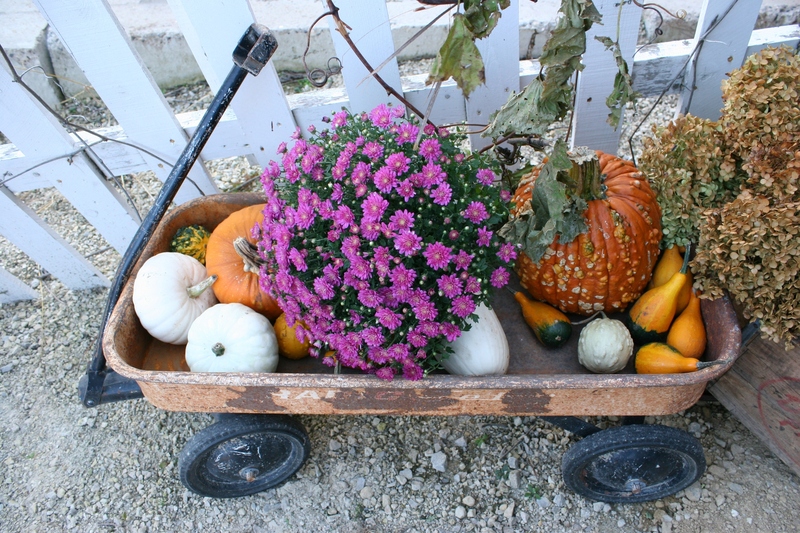 Garden goods provided for great fall decorating. 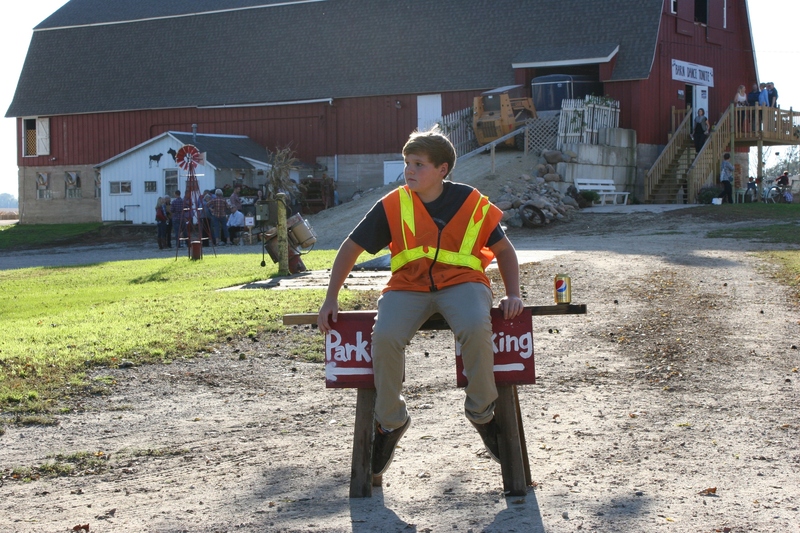 One of numerous parking attendants waits for vehicles to arrive. The kitchen crew, and Debbie, prepare for guests to arrive. 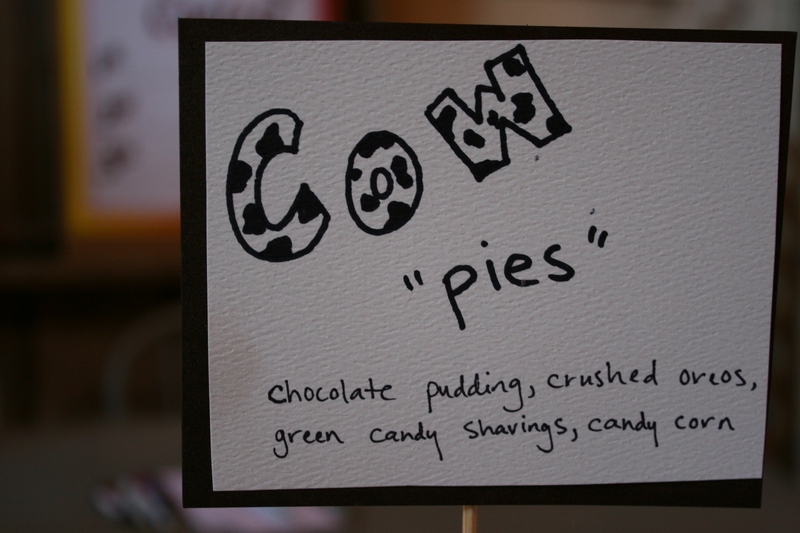 Posted on the pie table. Debbie, the eldest in a family of I’ve lost count how many siblings, could be a professional party planner. She’s that good at food planning, decorating and remembering every single detail of creating a memorable and fun event. John is right there beside her, assuring, too, that everything comes together. They complement one another. 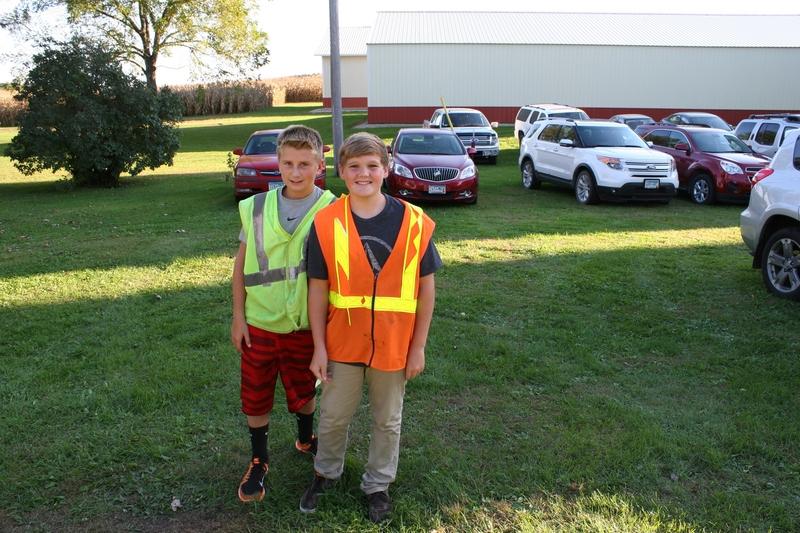 And even though they pulled in family and friends—for decorating, parking, kitchen duty, bartending, pie judging and more—ultimately they are the ones who managed to plan for and welcome 300-plus guests to their farm. The kids all wanted rides on the golf cart. 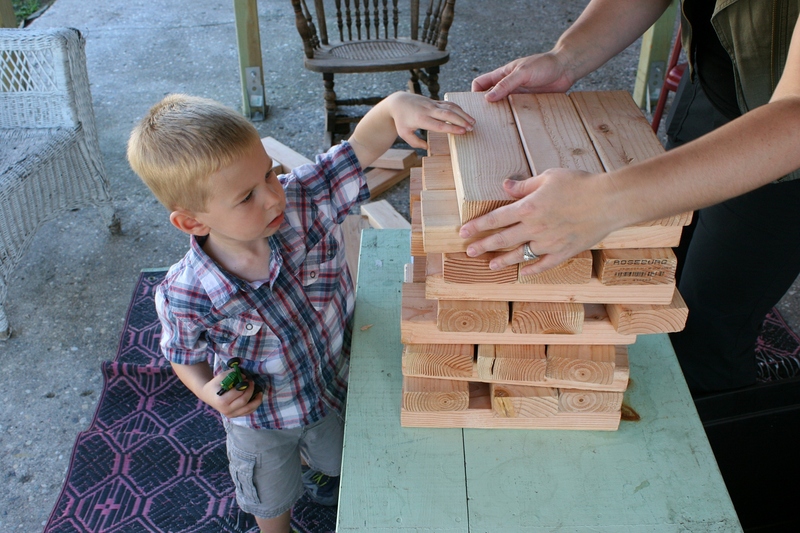 This little guy wouldn’t even set down his toy John Deere tractor to stack over-sized Jenga blocks. 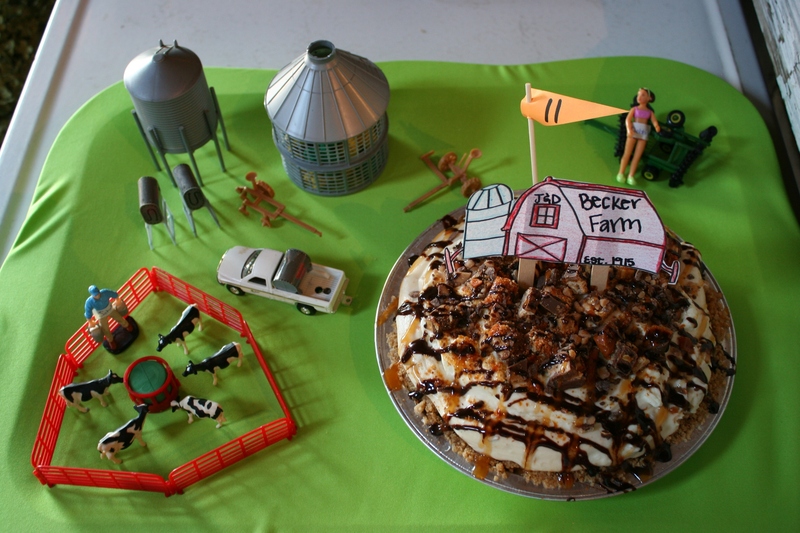 This farm-themed pie drew lots of kids to look and some to play. 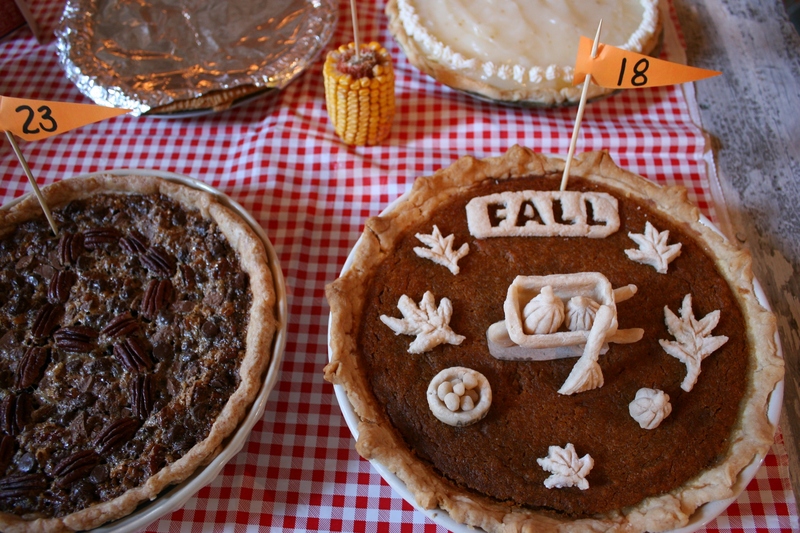 By far the most creatively-staged pie. Lots of visiting inside and outside the barn. One family member flew in from England. And I overheard, mid-evening, young boys protesting their family’s early departure. 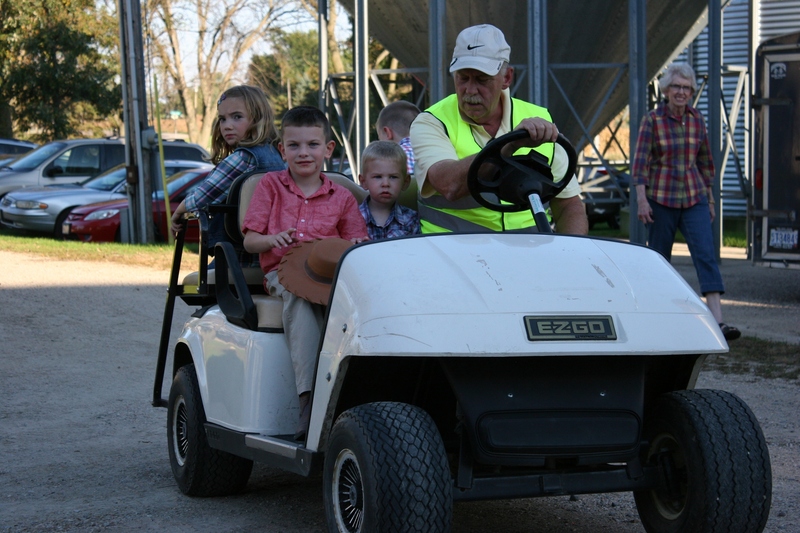 I watched kids scramble onto a golf cart for rides with the guy giving lifts from parking areas to barn. 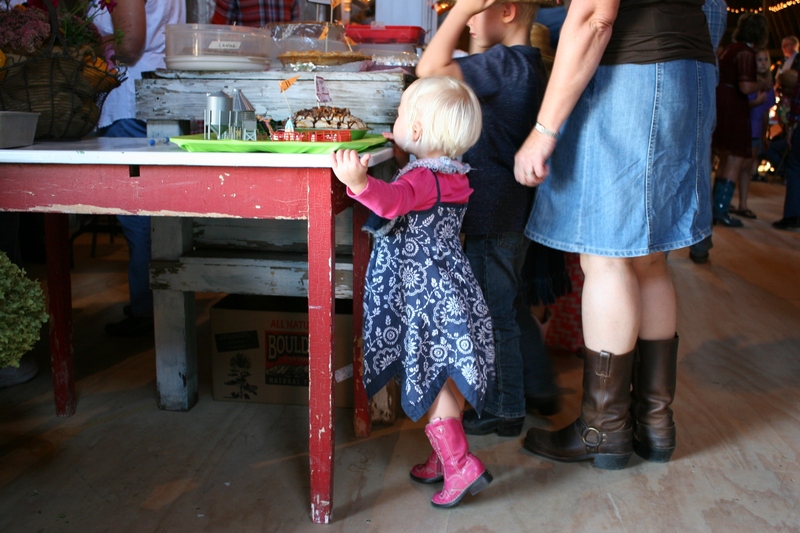 A smile curved my mouth at the sight of young boys clutching John Deere tractors, a wee sweet girl in pink cowgirl boots peering at pies, and circles of folks visiting in the barn. The opportunities for sweet portraits in the golden hour of photography were endless. 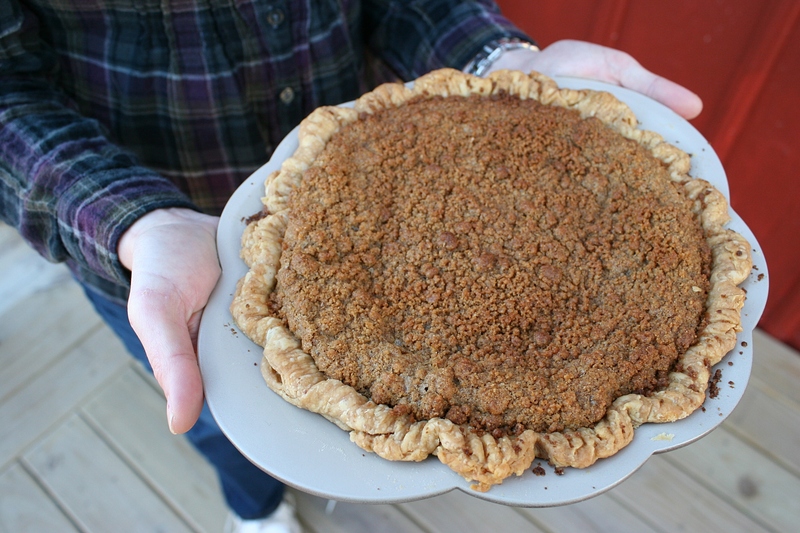 My dear friend Mandy arrives with her pear-gingersnap pie still warm from the oven. It was absolutely delicious as I sampled it after the pie judging. My husband tried on this abandoned cowboy hat. But it was several sizes too small. The scenes unfolding before me appeared down-home rural Americana—girls swaying in a weathered porch swing, a guest bearing pie for the pie-baking contest, a straw cowboy hat resting on a picnic table. 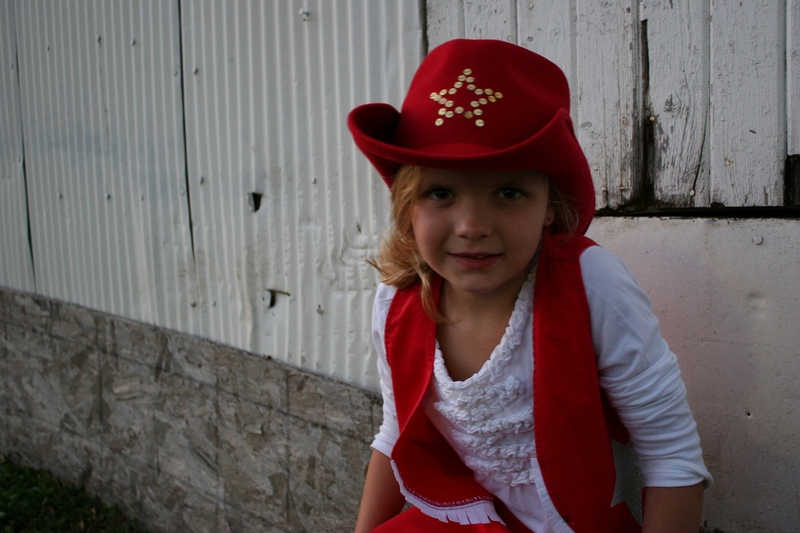 I photographed darling Ava at the last barn dance and her mom asked me to photograph her again. Daylight was fading. Yet I managed to snap a cute portrait. 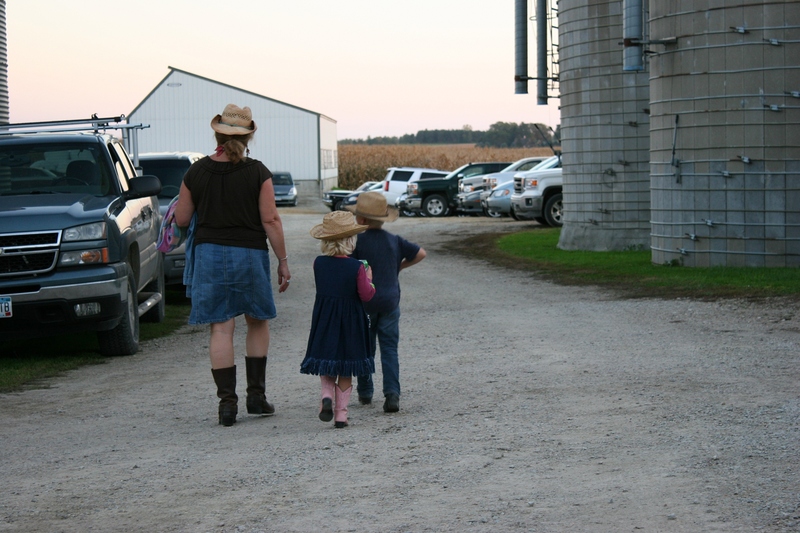 A grandma and her grandkids dressed in western attire for the barn dance. 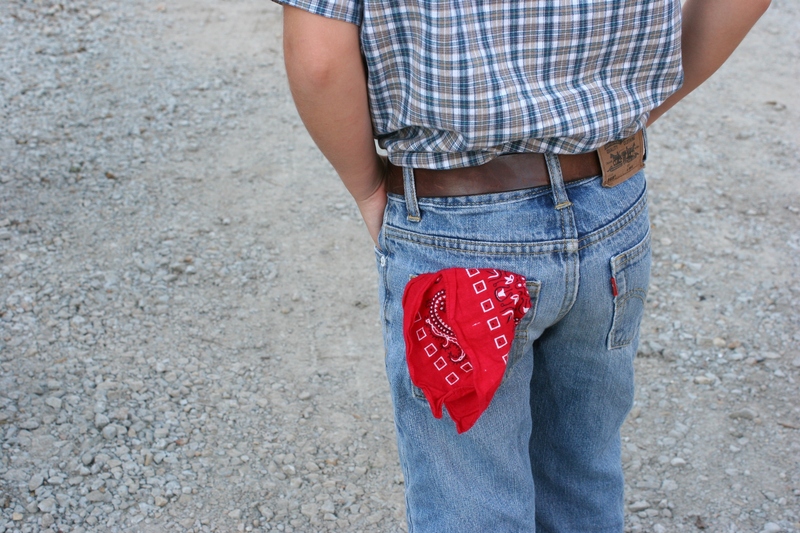 Many a farmer once carried a hankie/bandanna in his pocket. Although costumes were not required, vintage or western attire was encouraged. I tied a red bandanna around my neck and called it good. But the kids, oh, the kids. So cute in their cowgirl/cowboy hats and garb. And even some adults dressed western style in flannel shirts and hats, in bibs or with red hankie in pocket. Many sported western boots. 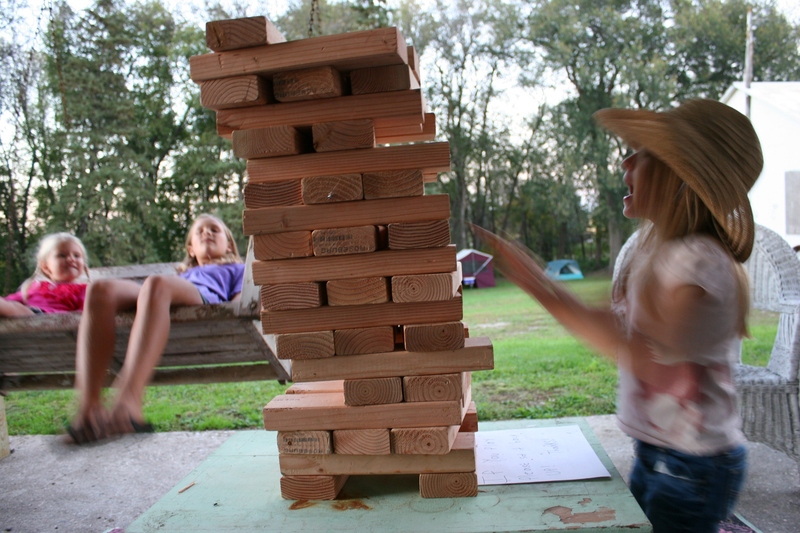 While two girls sway on a swing, another stacks blocks. Debbie and John, loving aunt and uncle that they are, assured the kids had plenty to do, passing along to the next generation memories connected to family and the old barn. 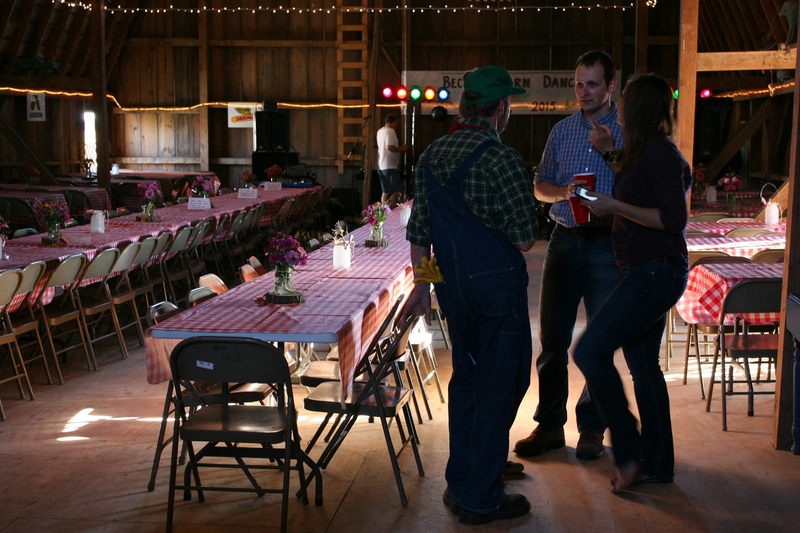 FYI: Click here to read my first post about the barn dance. And check back tomorrow for one final post. The band, Downtown Sound, sets up inside the Becker barn for a 100th birthday barn dance. 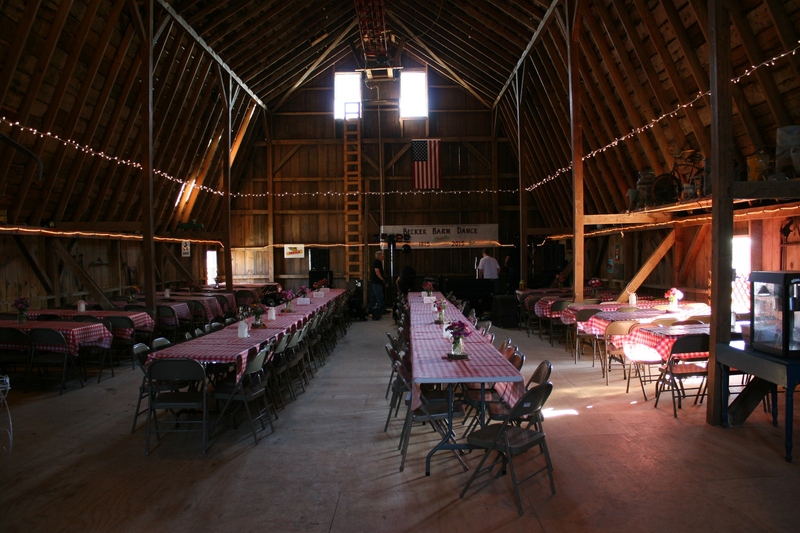 THE OLD BARN was all decked out with rural décor. 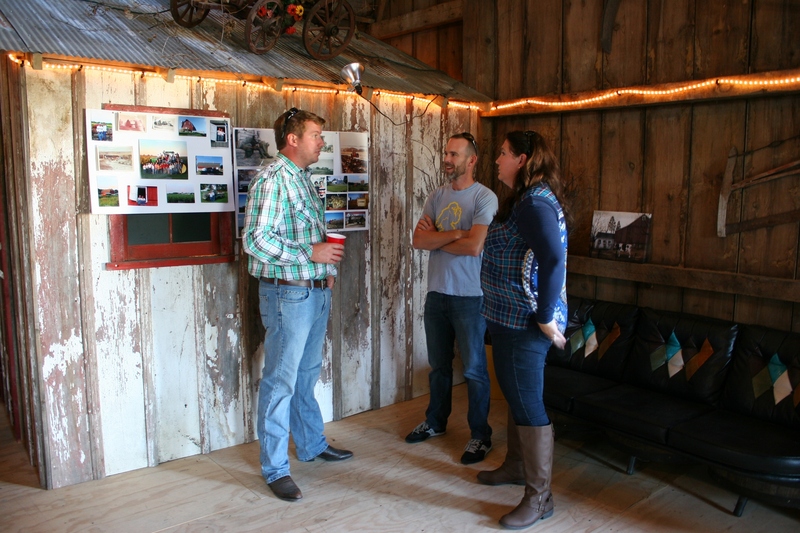 Guests gather in a corner near a display of Becker family farm photos. The images are displayed on the exterior of the bathroom built into the barn. 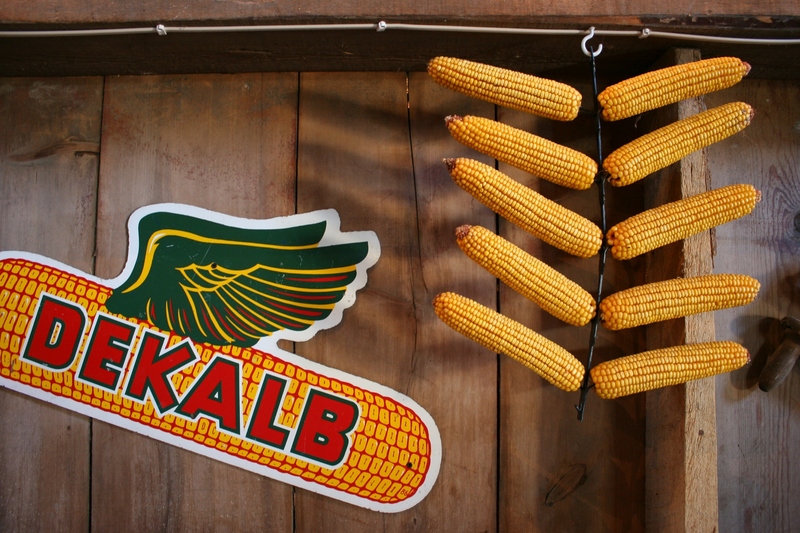 Ear corn and seedcorn signs. Washboard and washtubs. 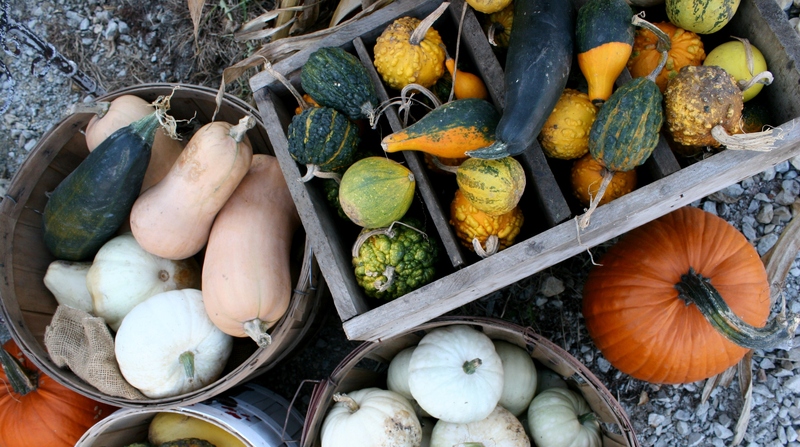 Gourds and pumpkins. 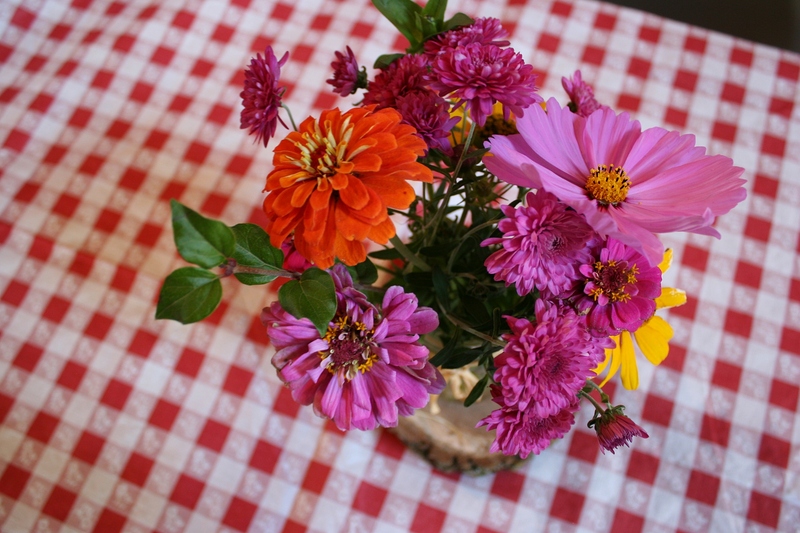 Fresh-cut zinnias, cosmos and other garden flowers in jars. 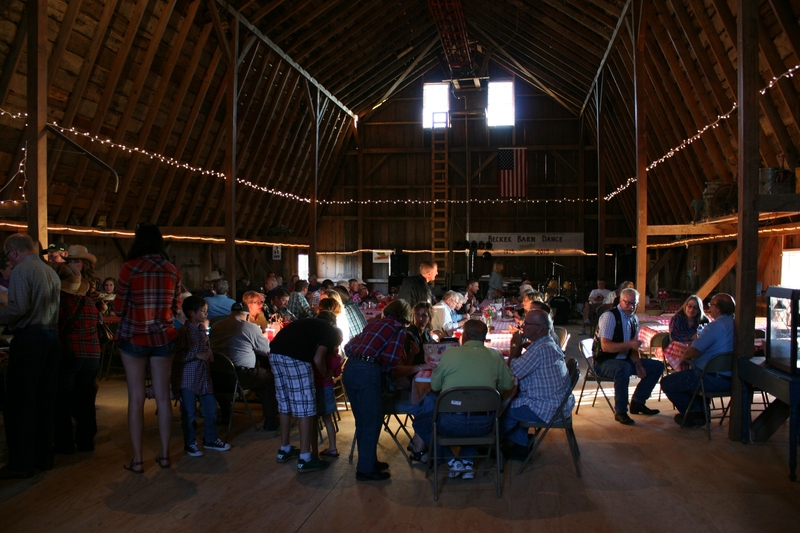 Red-and-white checked gingham tablecloths. And in a corner, a collection of family and barn photos. 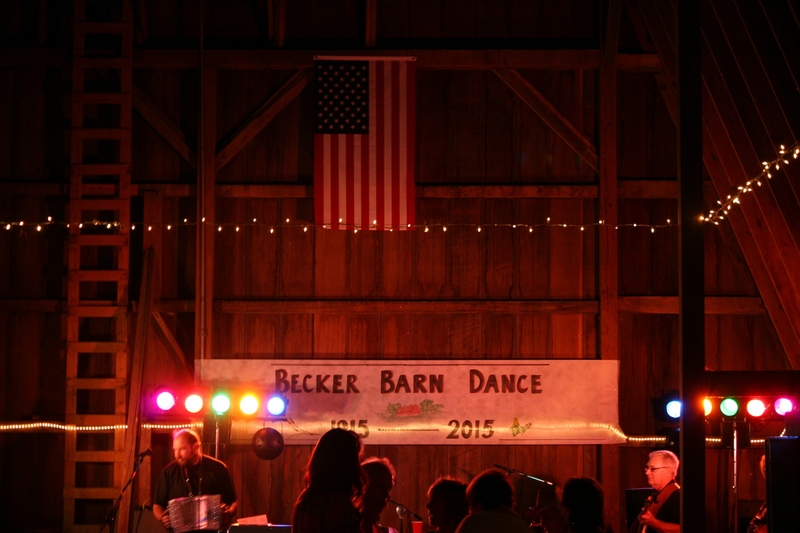 Across the end of the hayloft, just above the section where the band, Downtown Sound, was setting up, and below an American flag, a banner blazed Becker Barn Dance 1915 – 2015. 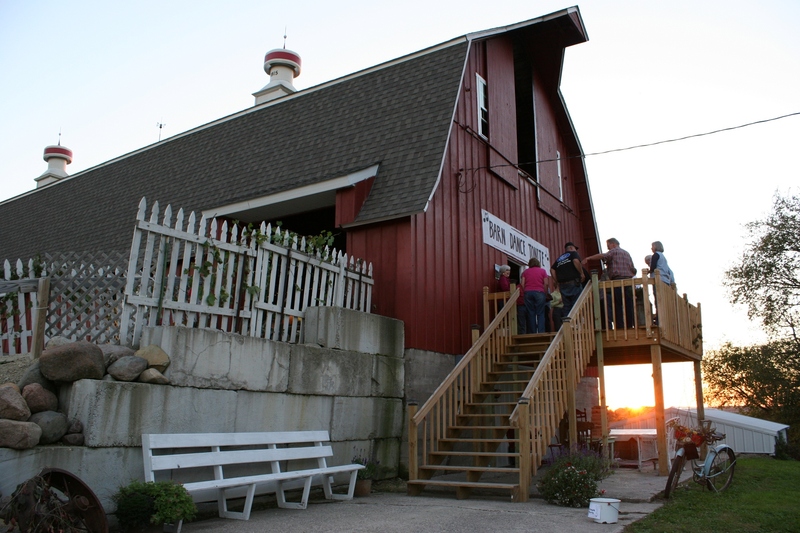 Guests gather on the hayloft deck as the sun sets Saturday evening. 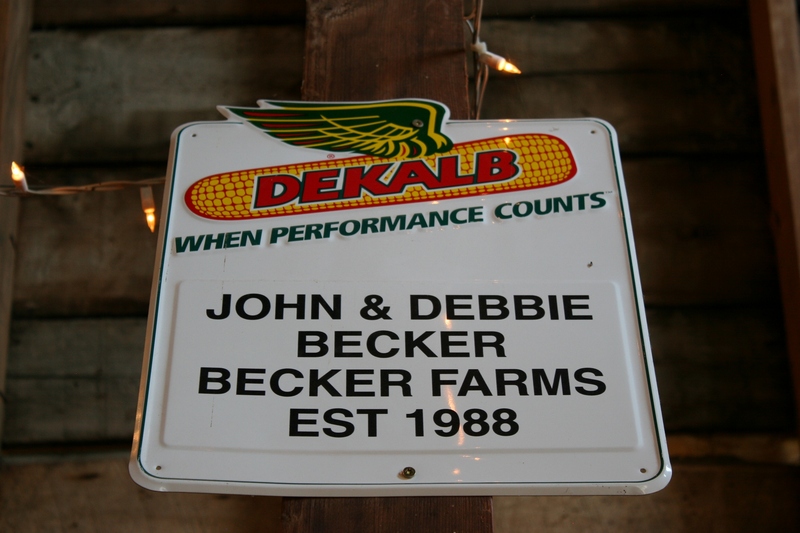 John and Debbie Becker purchased the farm from John’s dad, Herb, in 1988. 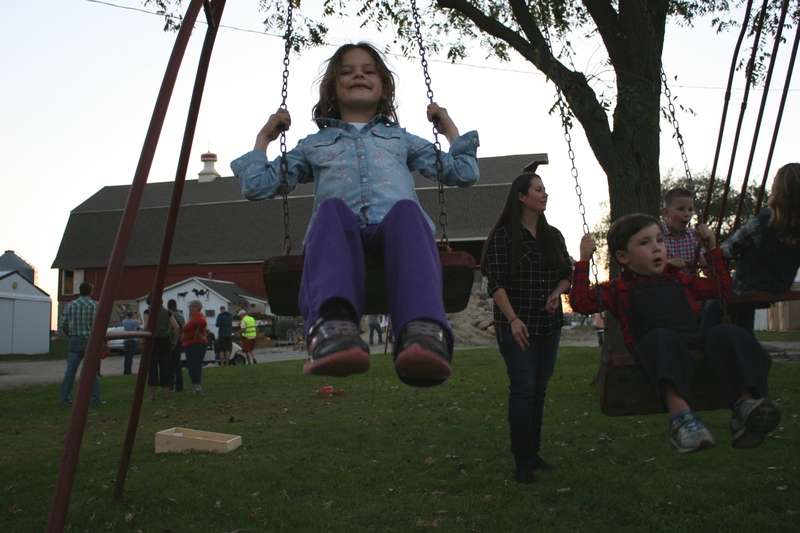 Hundreds gathered on a perfect September Saturday evening at the John and Debbie Becker farm just west of Dundas along Rice County Road 1 to celebrate the birthday of a sprawling 36-foot by 100-foot barn built in 1915. One hundred years ago. 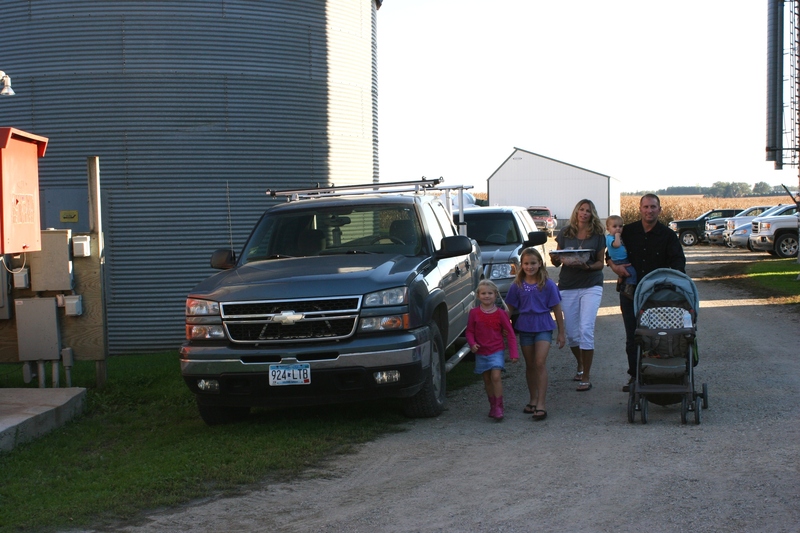 Family arrives for the barn dance and party. A vintage photo of the Herb and Dorothy Becker family. The current barn owner, John, is the youngest in the family. Family and friends visit before the meal and dance. 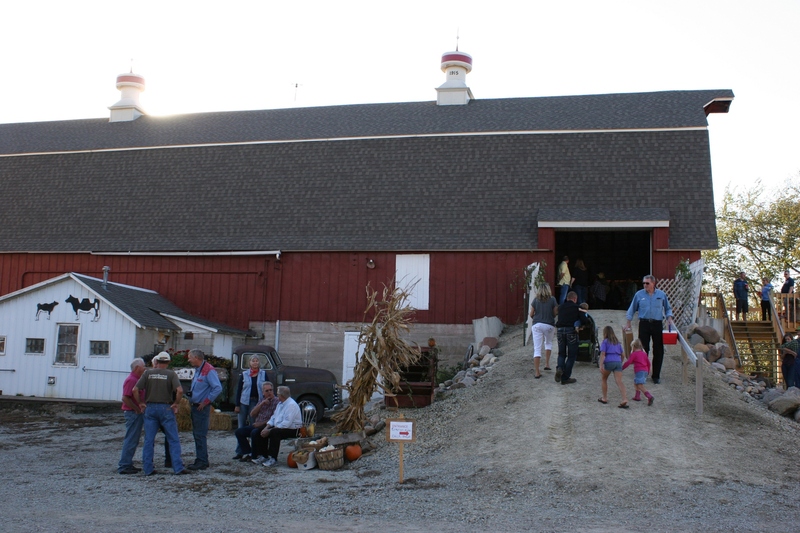 But this party was about more than commemorating this century-old massive barn in the Becker family since Herb and wife, Dorothy (both now deceased), purchased the farm in 1948. 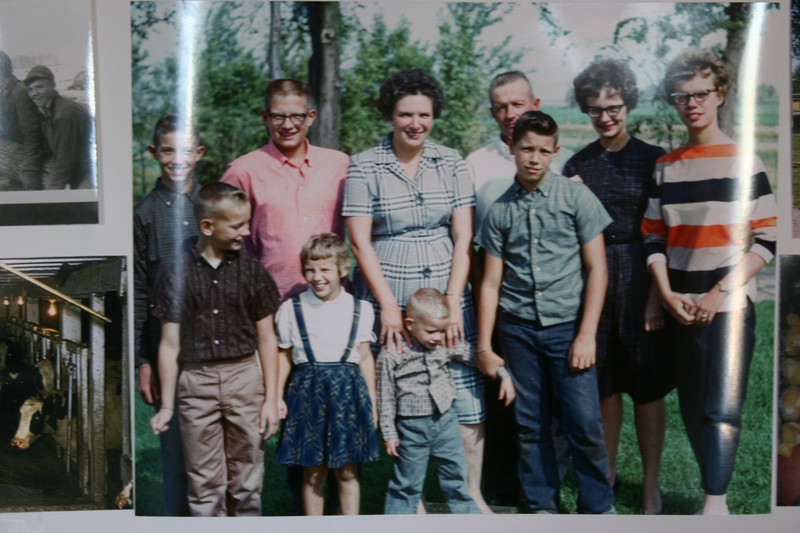 It was also about a coming together of family—only one of the elder Beckers’ descendants was missing—and friends to celebrate the land, farming and the rural way of life. 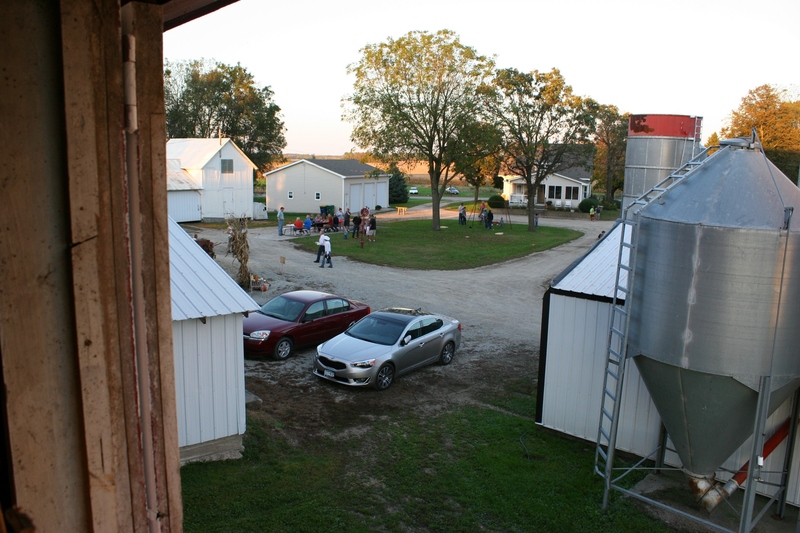 A view of the farmyard and barn dance guests from a hayloft window. 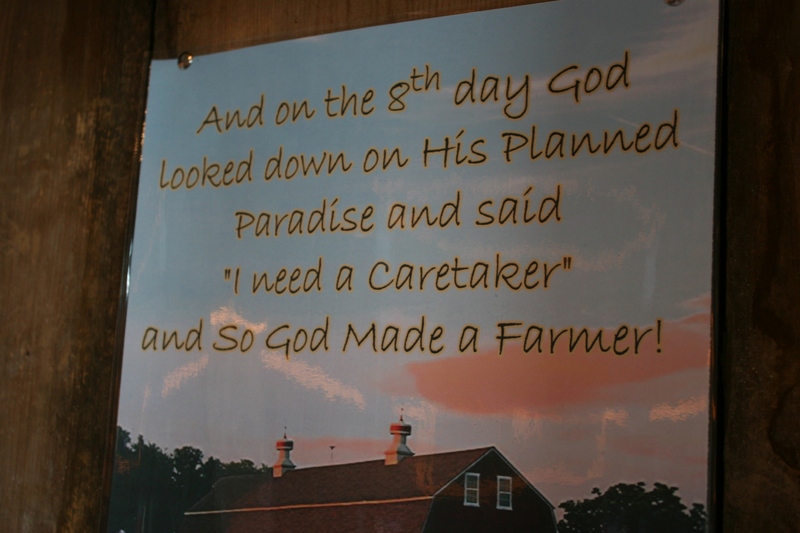 Posted in the barn, a photo of the Becker farm and an appropriate saying. 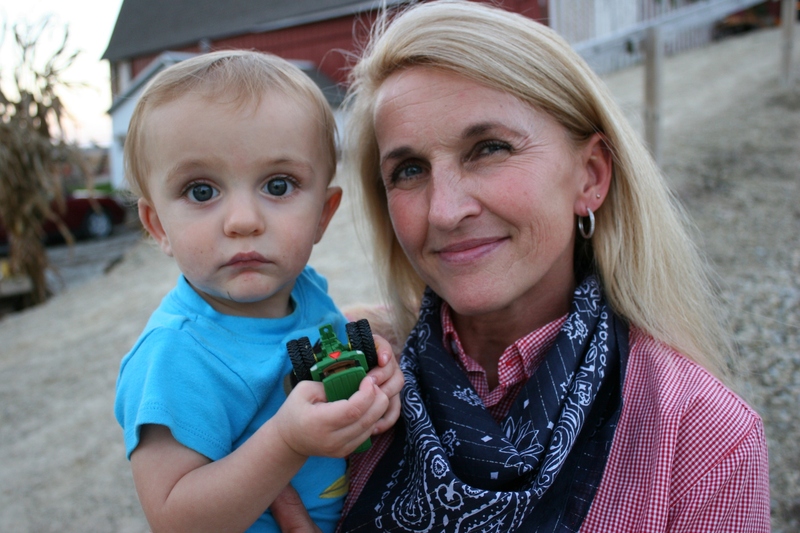 Aunt and nephew at the barn dance. 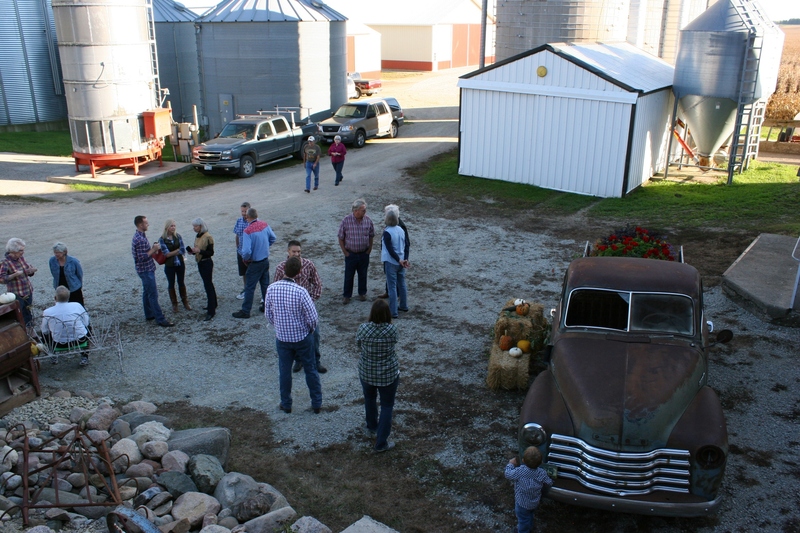 As I gazed through an open hayloft window at the crowd mingling in the farmyard below, I considered how thankful I am to have grown up in rural Minnesota, to have this close connection to the land and to extended family. Just like the Becker family. The sun spotlights machine sheds. Vehicles parked in every nook and cranny of the farm. 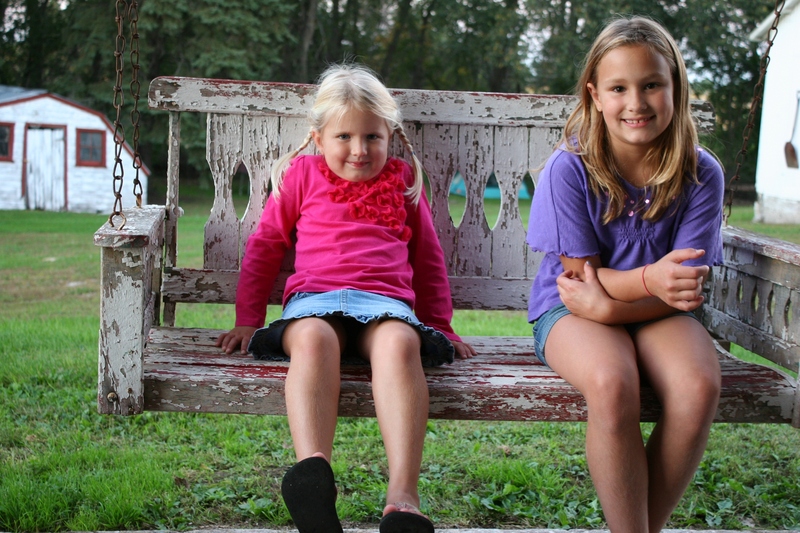 A vintage swingset proved a popular spot. 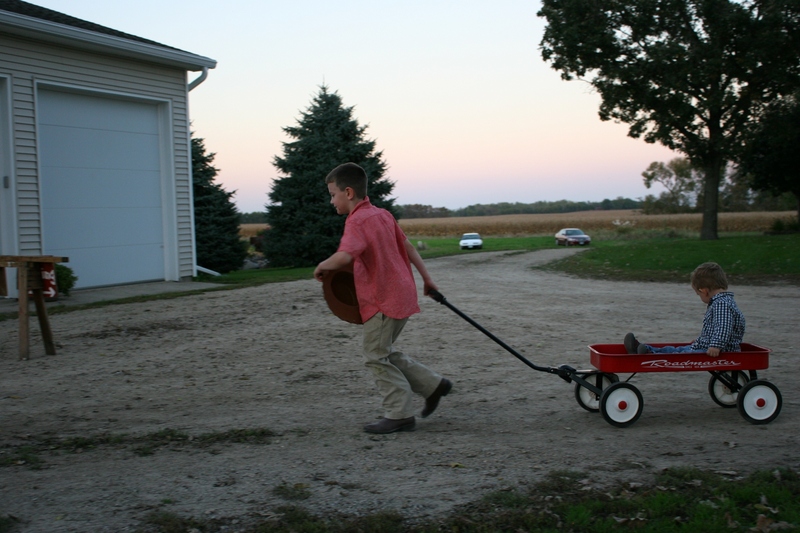 Here, on this evening when the sun set a brilliant gold across ripening corn fields and edged shadows around silos, kids rumbled wagons across gravel, pumped legs high on an aged swingset, covered eyes in an old-fashioned game of hide-and-seek. It was like a flashback to yesteryear for me, back to simpler days when kids played with imagination and folks took time to visit. Nostalgia prevailed on this September evening of a near full moon. 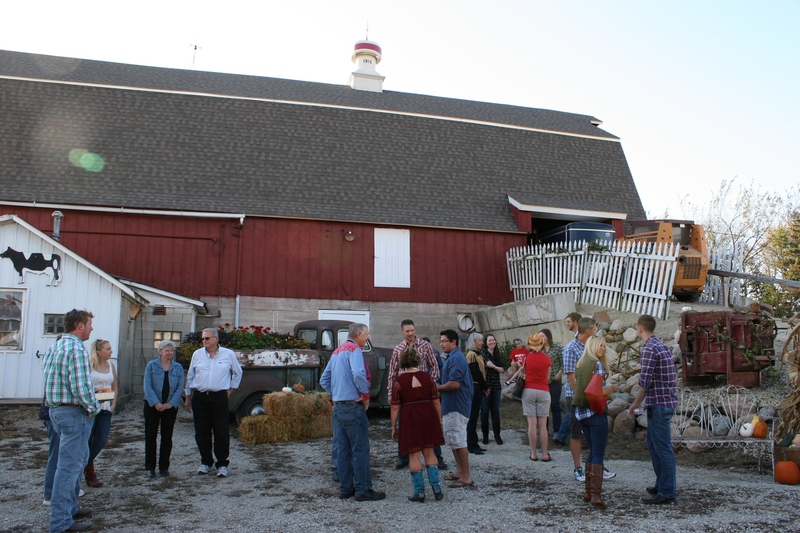 Host John Becker briefed guests on the history of the barn, known long ago for its neighborhood barn dances. In his youth, long before he bought this farm, John’s father attended dances here, where men sat on one side of the hayloft, women on the other. On this evening, all generations mingled in the hayloft and John reminded them to be thankful to the Lord for the harvest. 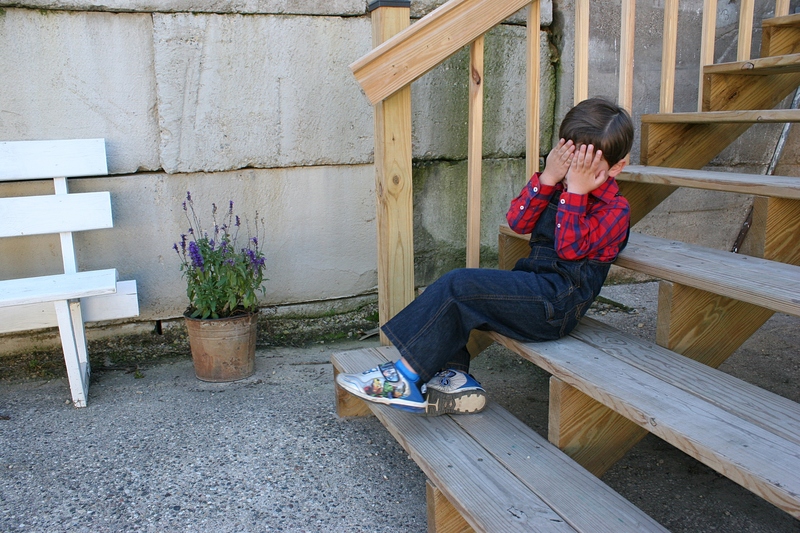 I was thankful to be here, sitting on a bench on the newly-constructed deck off the hayloft. Gazing at the peak of the barn toward the evening sky scattered with stars. Inside the band played Sweet Caroline as the autumn breeze cooled me. Later I would twirl, in my husband’s arms, across the cornmeal slicked plywood floor to a polka, flap my elbows to the chicken dance and rock it out to I Fought the Law (and the law won) and many more tunes. I danced until my muscles ached. And I smiled, oh, how I smiled. It’s been a long time since I’ve had this much fun, since I’ve forgotten the worries of life and immersed myself in the joy of a memorable evening with friends. 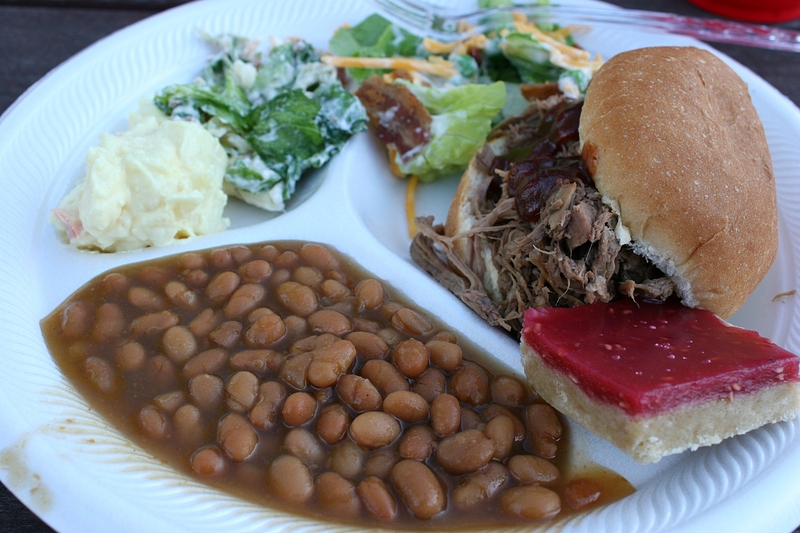 The food was equally as memorable with savory beef and pork sandwiches from Nerstrand Meats, baked beans and an assortment of salads and bars brought by guests. 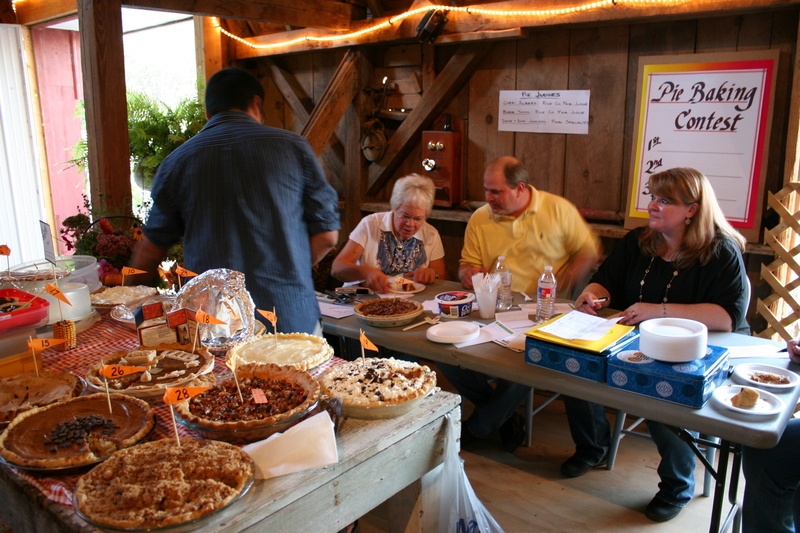 Later, after judges sampled pies in the pie-baking contest, plated pies presented a dessert smorgasbord. And if that wasn’t enough, sausage and cheese, chips and dip and other snack foods were available for grazing later. The side entry into the hayloft. 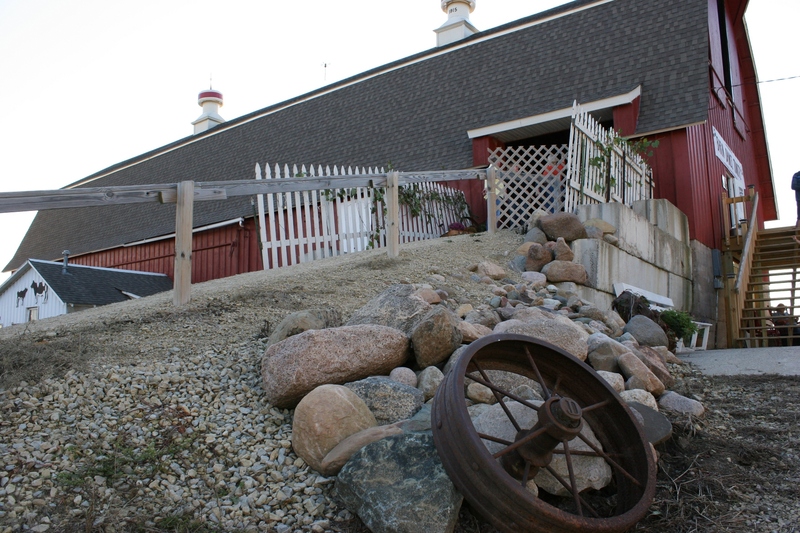 Some six hours after we arrived, Randy and I descended the steep walk-way into the hayloft and followed the gravel drive past the grain dryer (next to the yard light) toward vehicles parked on the lawn. We threaded our way toward our car, music fading as the distance widened between us and the 100-year-old barn. 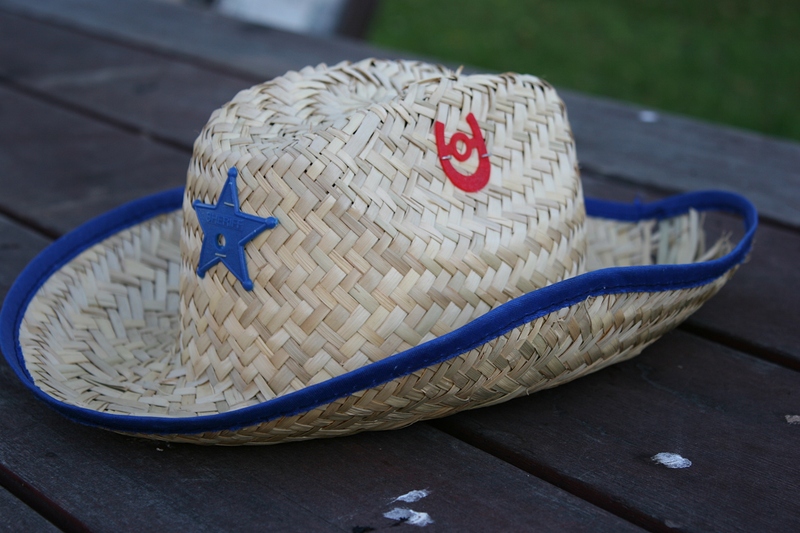 FYI: Check back for more photos from the barn dance in additional posts tomorrow and thereafter. Several years ago when my dear friends John and Debbie hosted a dance in their rural Dundas barn, I photographed these two boys. To this day, it remains one of my favorite portraits. Such sweetness in those faces. I didn’t ask the boys to pose as they did. The cowboy just slung his arm around the other boy. They may be cousins or brothers or simply friends. I don’t recall. But it’s obvious they enjoy each other and were having a good time. 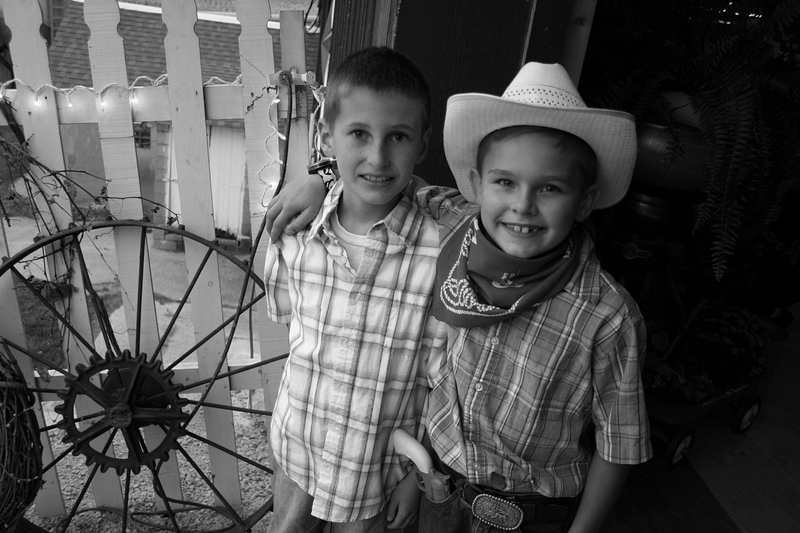 Maybe I’ll see the pair again this weekend, all grown up, perhaps sporting cowboy hats, maybe not. 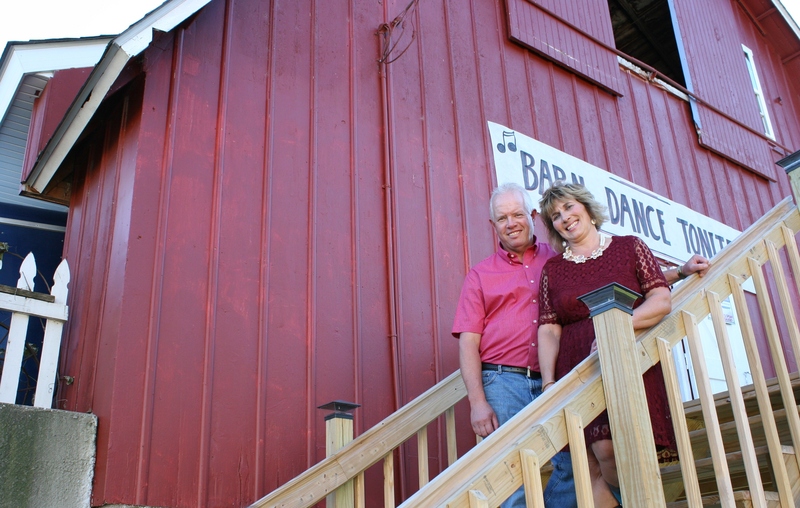 John and Debbie are celebrating the 100th birthday of their barn with an old-fashioned barn dance. 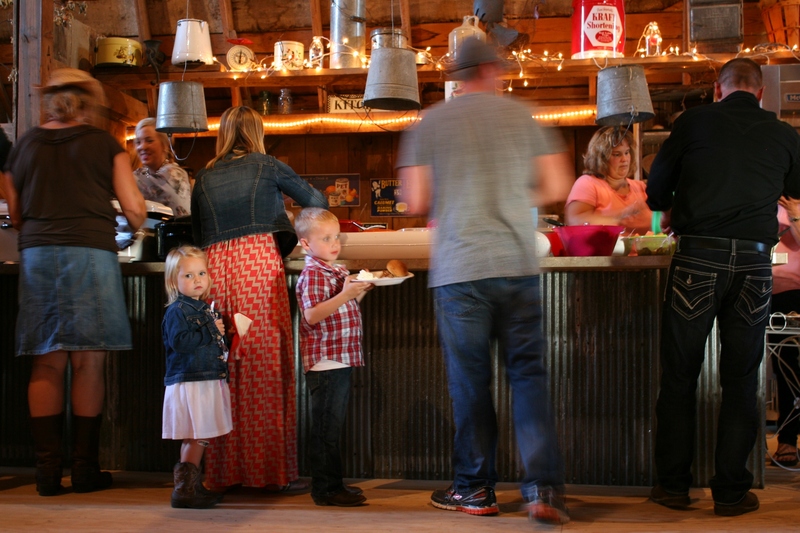 I can’t wait to kick up my heels to live music, chow down on great food (including meat from Nerstrand meats and pie from the pie-baking contest), mingle with party-goers, and simply delight in the ambiance of dancing in the hayloft. And, yes, I’ll have my camera in hand to document the event. The Basilica of Saint Stanislaus Kostka, named after a popular saint from Poland, is so massive I could not get the entire basilica in a photo. 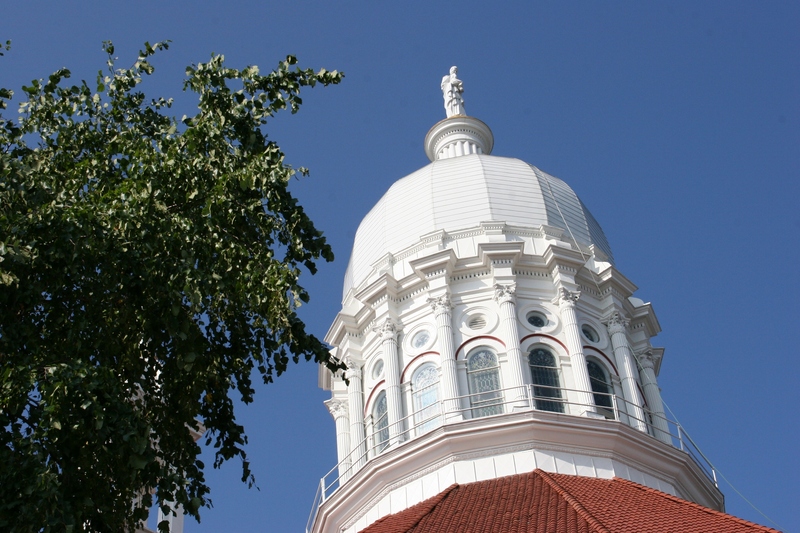 It’s located at 625 East Fourth Street in Winona, Minnesota. 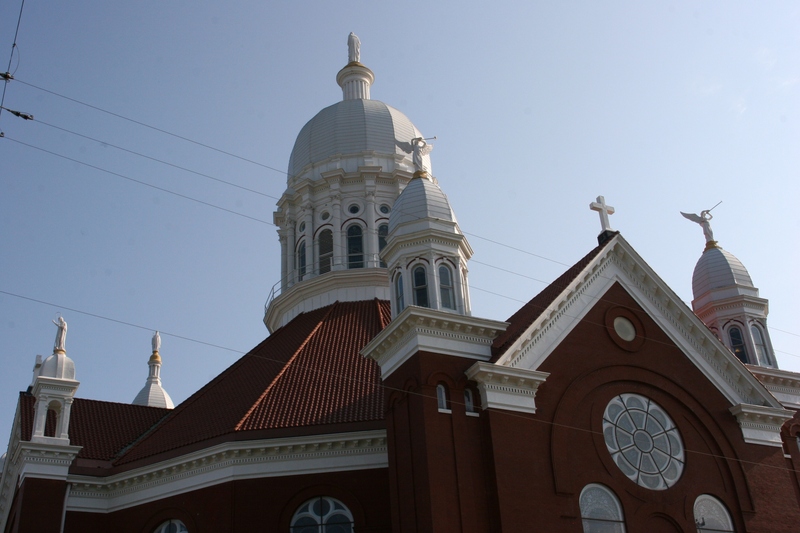 UNOFFICIALLY, PARISHIONERS CALL the basilica St. Stan’s. I like that. It seems fitting in an age when the current pope, Pope Francis, has connected in an everyday sort of way with the faithful, Catholic or not. 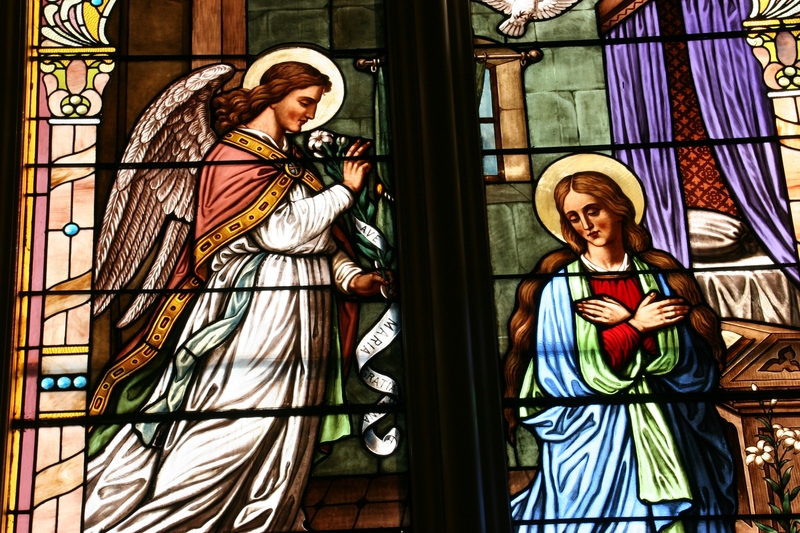 The basilica includes stunning stained glass windows. 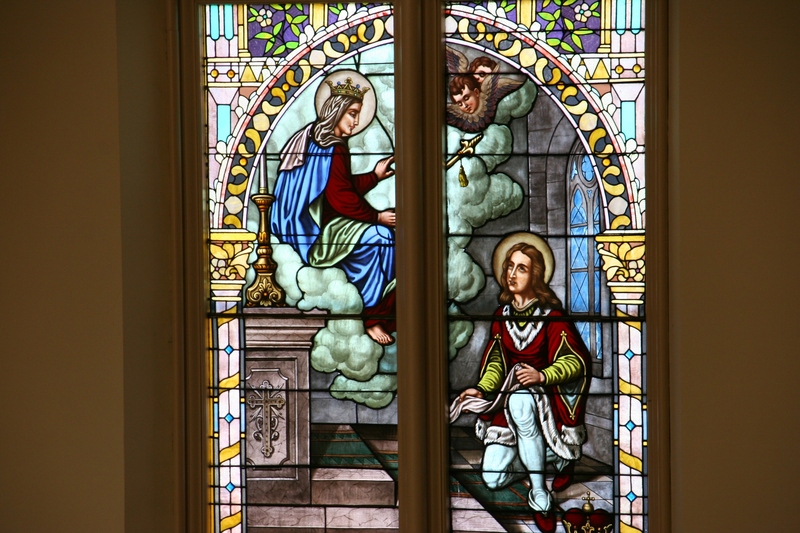 There are many other buildings in Winona which feature stained glass, including Tiffany stained glass. This river town is also home to six stained glass studios. I am Lutheran. But denominational affiliation matters not when touring a beautiful house of worship. Or appreciating a man who oversees with a blessed sense of ordinariness. 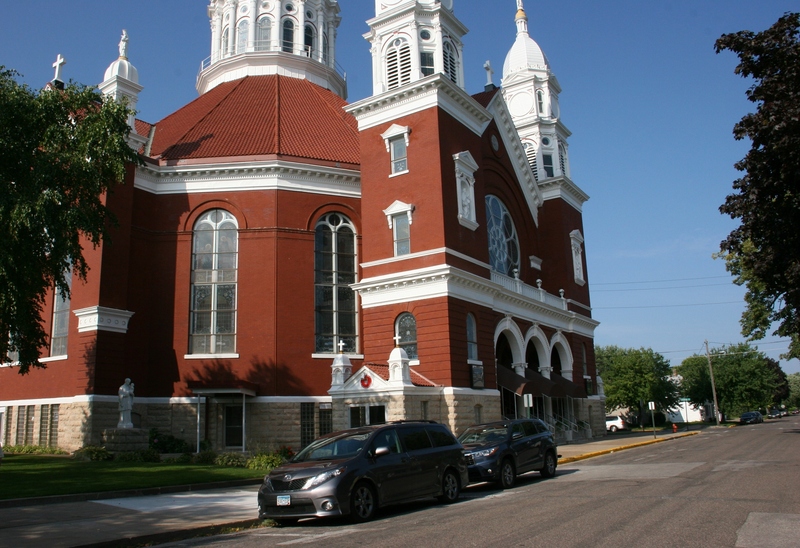 Several weeks ago my husband, a Catholic turned Lutheran, and I visited the Basilica of Saint Stanislaus Kostka, aka St. Stan’s, in Winona. 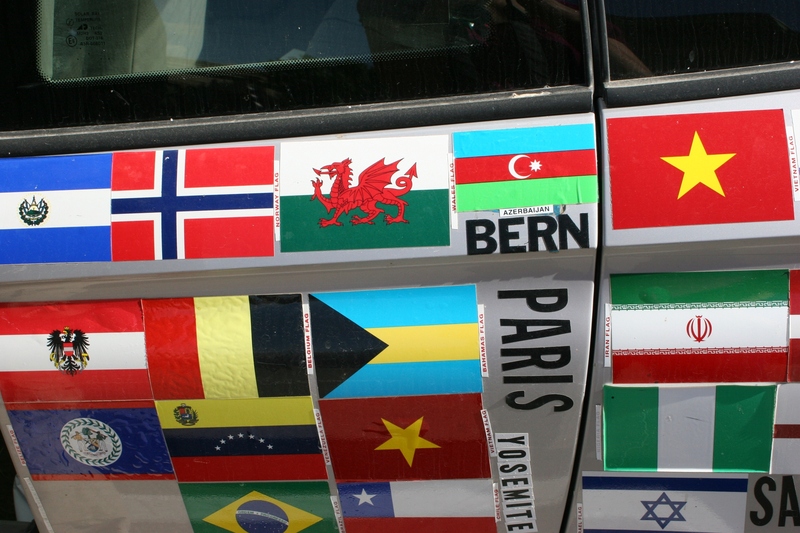 Touring churches interests us from multiple perspectives. Students file in for morning Mass. 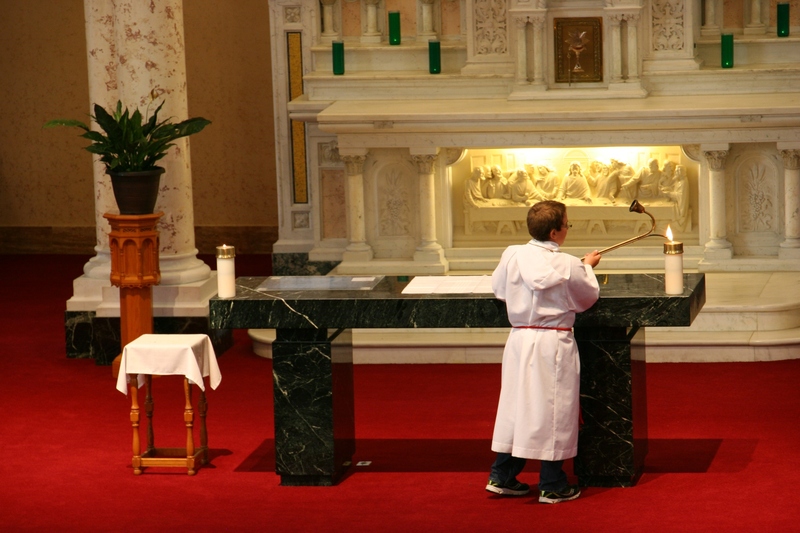 An altar boy prepares for Mass. 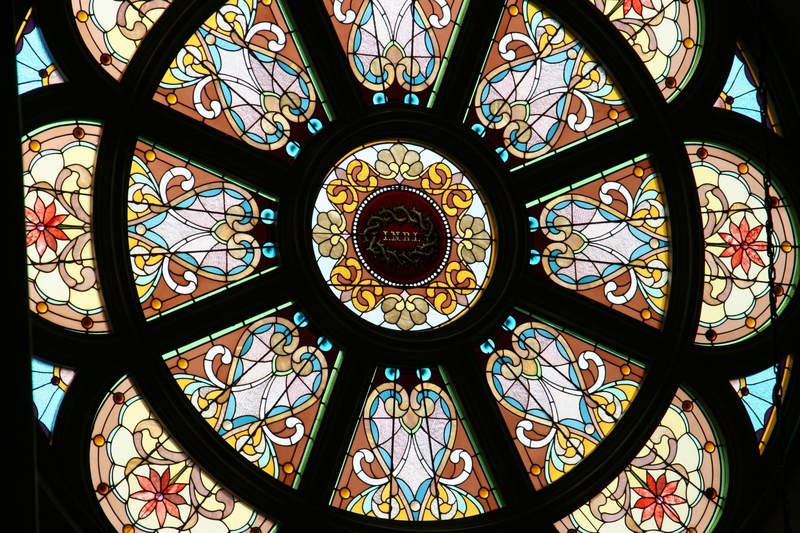 The stained glass windows are incredible in their sacred symbolism and beauty. 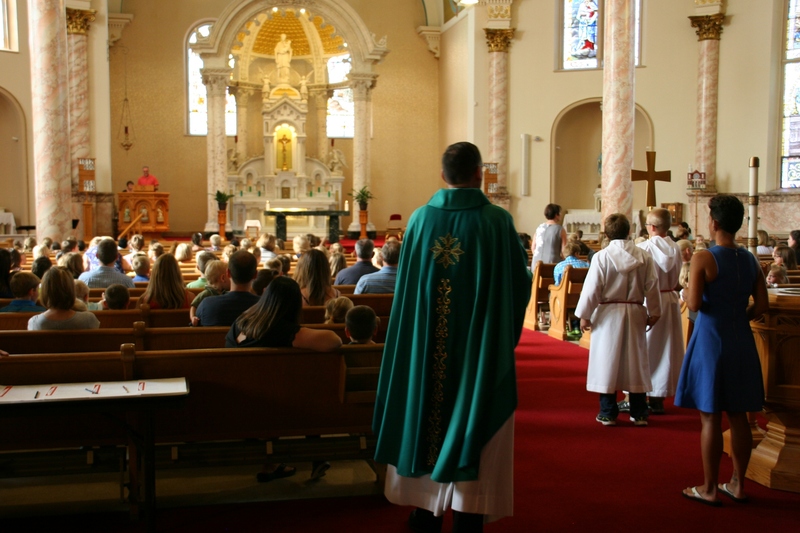 We arrived at St. Stan’s shortly before a children’s Mass, leaving us to observe from the balcony the reverent holiness of an altar boy lighting a candle, the filing of elementary students into pews, the light of a sultry summer morning filtering through stained glass windows. 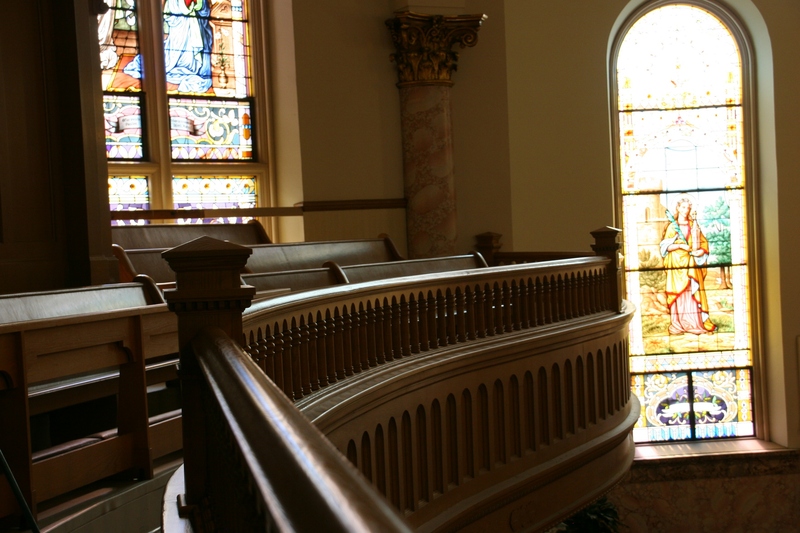 Lovely morning light filters through stained glass onto the curved balcony railing. 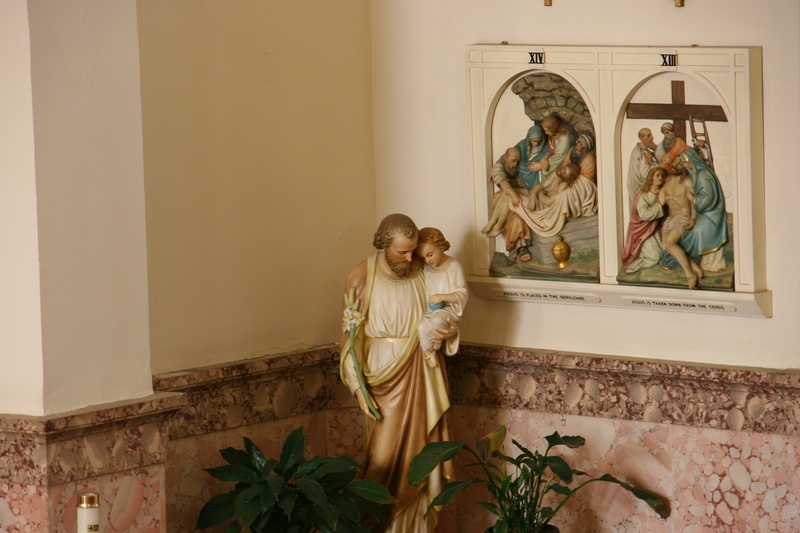 A statue is tucked into a corner below stations of the cross. 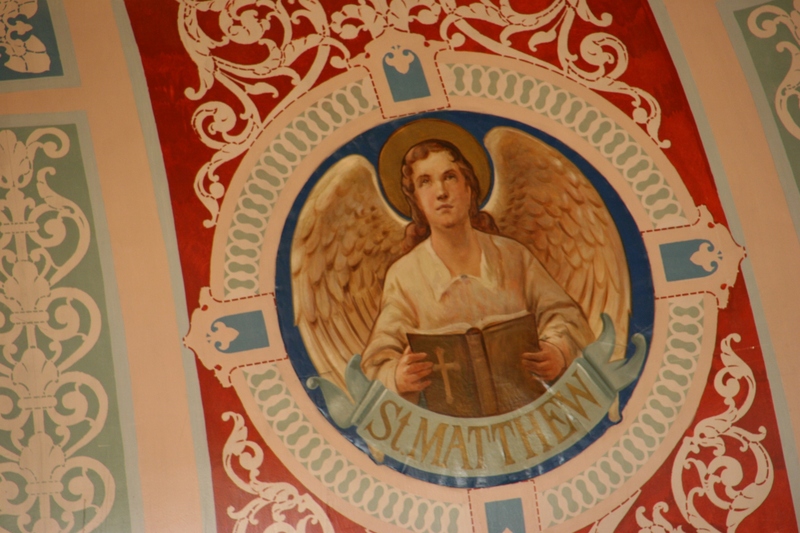 The paintings inside the dome are exquisite in their detail. 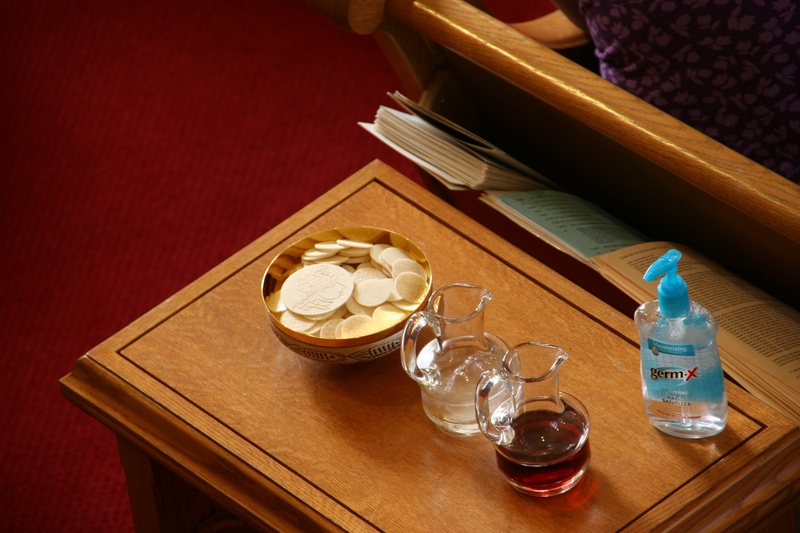 The bread and the wine before they are carried to the front of the sanctuary. I stood there in awe, swinging my camera lens toward marble pillars and stained glass, statues and crucifixes, curving wood and paintings, Communion wafers and words in Polish. The upper portion of the basilica at its main entry. 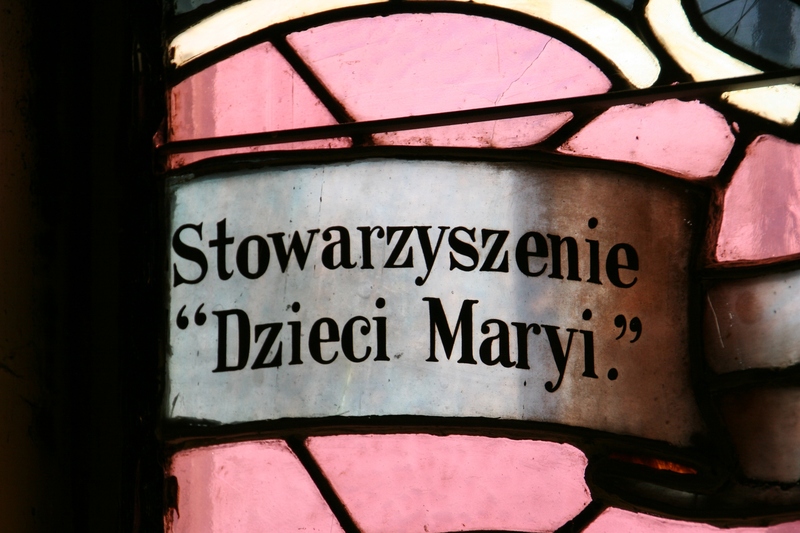 This is a church of Polish immigrants. 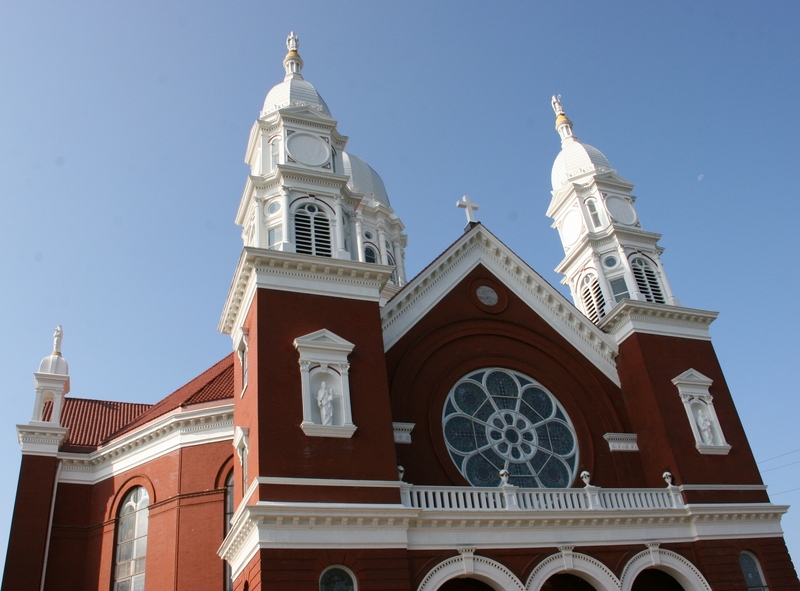 Built in 1894 – 1895 of brick and stone in Romansque style (in the form of a Greek cross) by the Winona architectural firm of Charles G. Maybury & Son, the basilica is on the National Register of Historic Places. 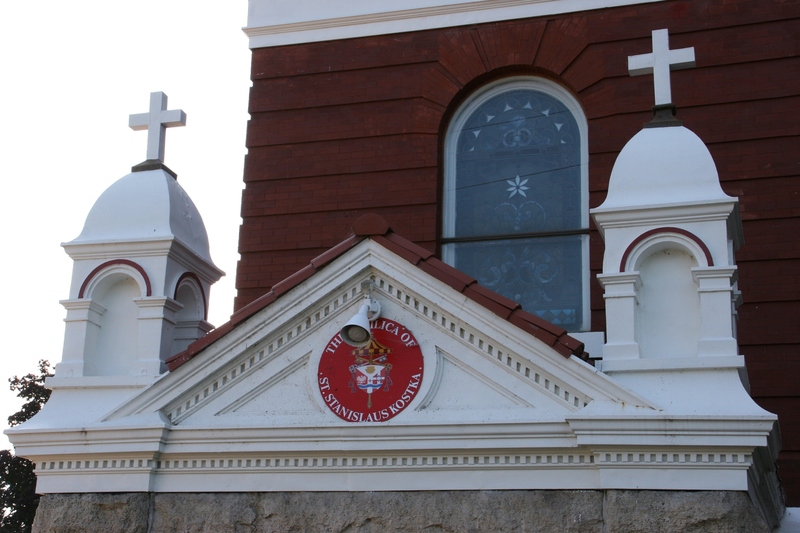 With its designation as a basilica, St. Stan’s also received a crest symbolic of important events in its history. Click here to learn about the crest. 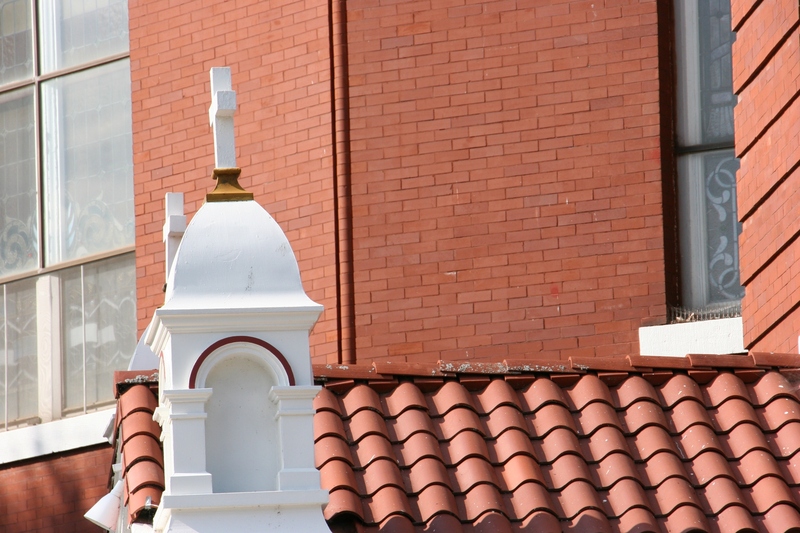 Not knowing the difference between a regular Catholic church and a basilica, I learned from online research that a basilica has received special privileges from the pope. 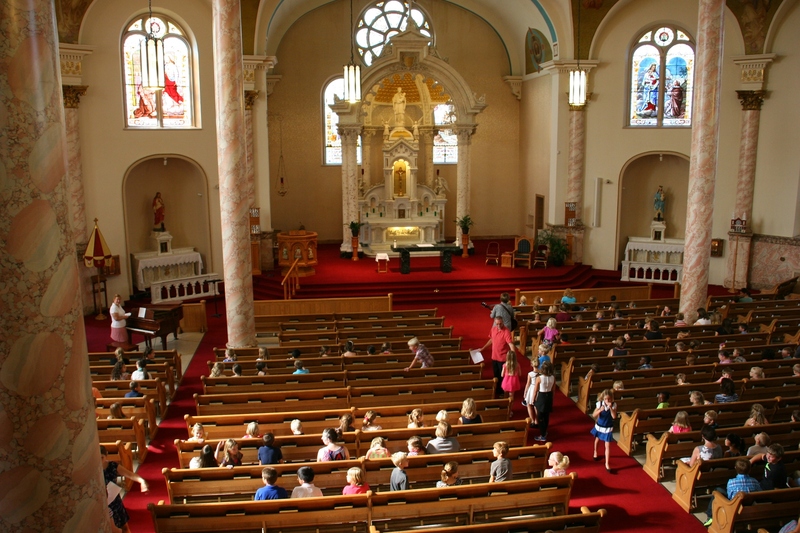 St. Stan’s rates as a minor basilica , the 70th in the U.S. and only one of two in Minnesota. (The other is the Basilica of Saint Mary in downtown Minneapolis.) 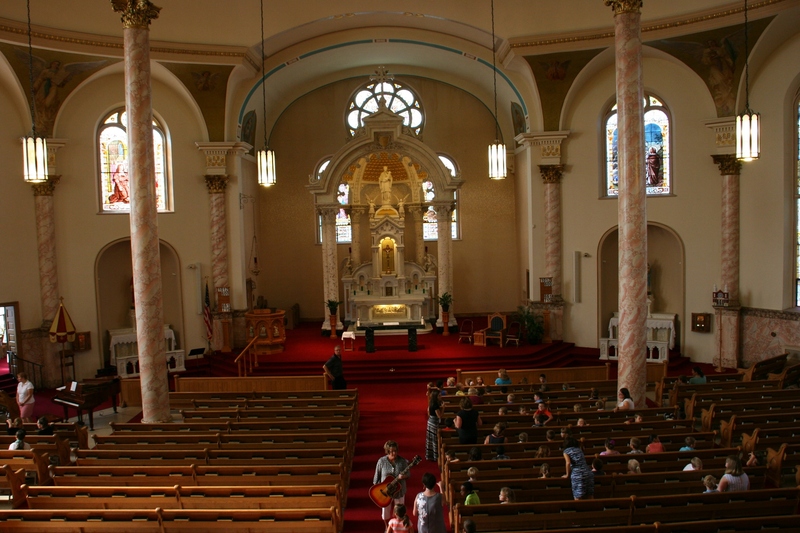 The title ties to the extraordinary architectural quality of the building and to the congregation’s significant Polish heritage, according to a 2011 press release from the Roman Catholic Diocese of Winona announcing the designation by the Vatican. 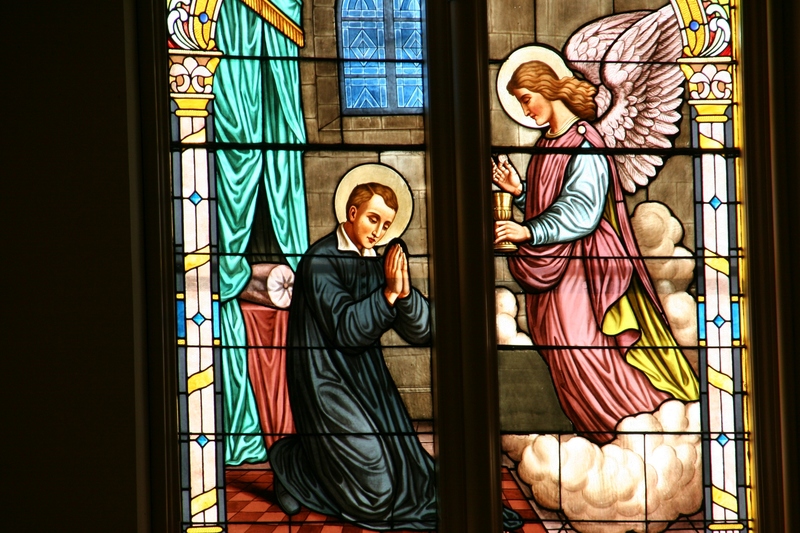 The stained glass windows truly are religious works of art. 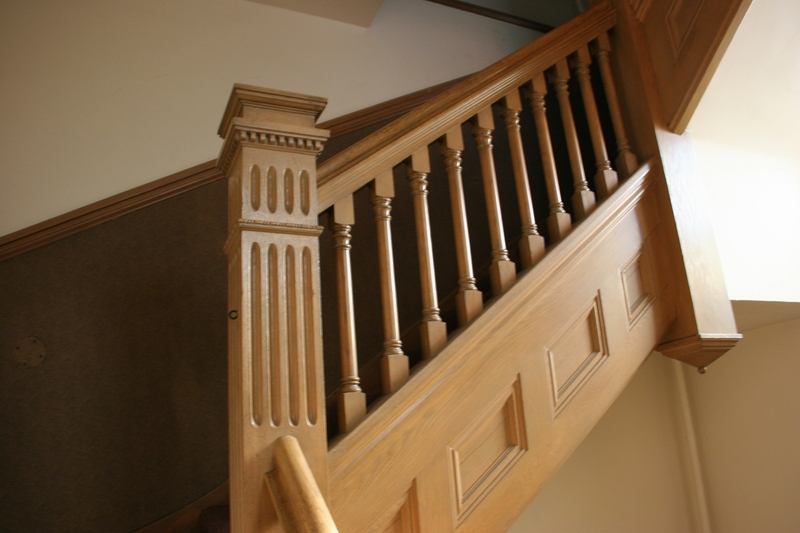 The stairway to the balcony features incredible craftsmanship. Terminology and privileges aside, this is one impressive house of worship. It’s artful and splendid. Reverent and meaningful. Personal, yet powerful in its sheer size. I expect many a worshiper has found comfort in these stained glass windows. This massive place holds generations of family history. Imagine the sins confessed and forgiven here, the blessings bestowed, the holy water sprinkled, the families who’ve grieved and celebrated within the walls of St. Stan’s. The priest is about to proceed up the aisle to begin Mass. To witness the next generation in worship on a Friday morning in God’s house reaffirms for me that the faith of our fathers remains strong. 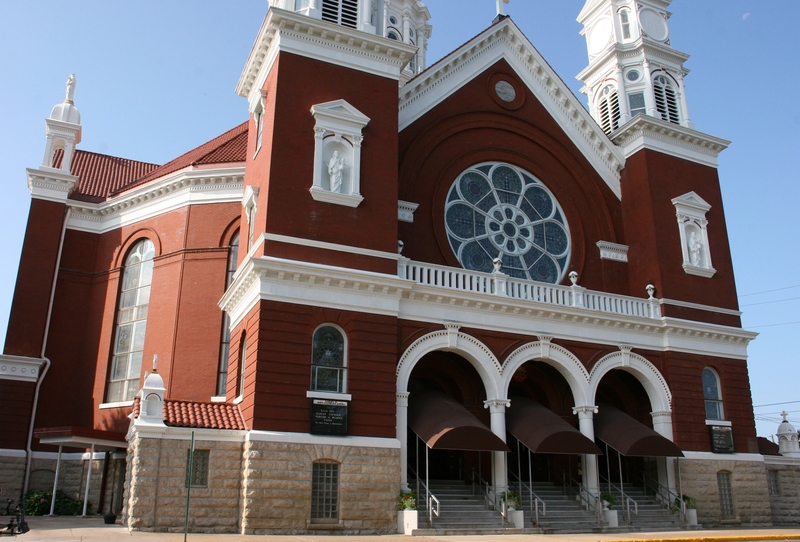 Just like this aged basilica in the Mississippi River town of Winona. A back view of St. Stan’s. 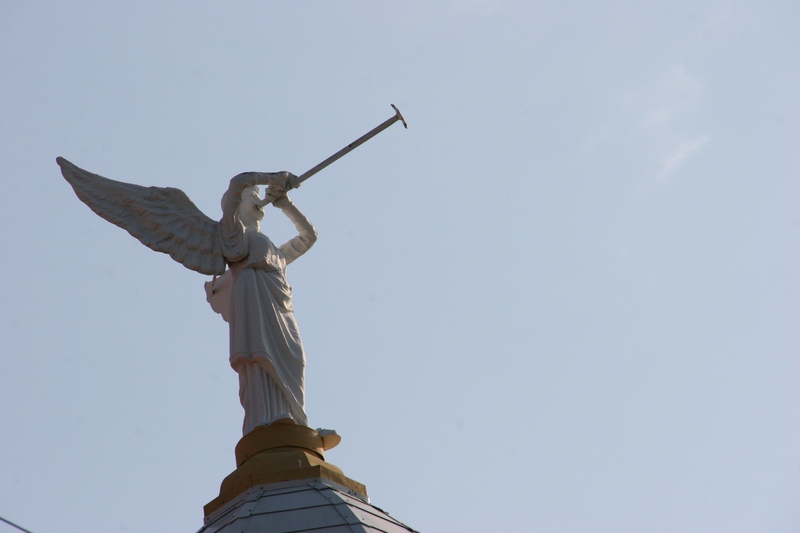 Angel art atop a tower. 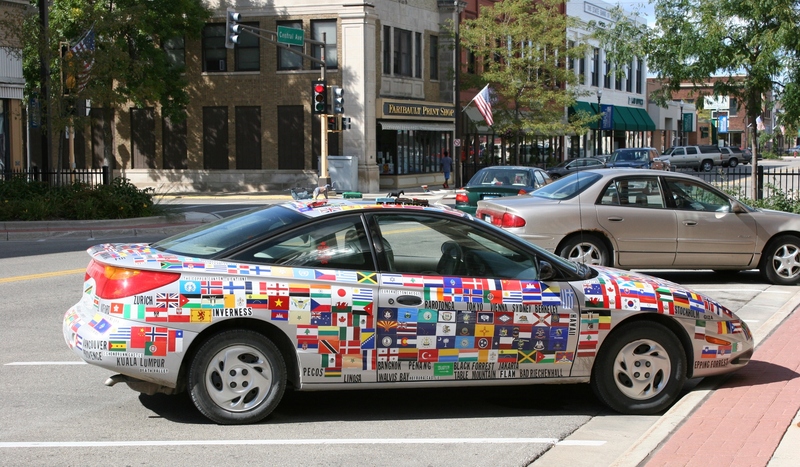 I’VE SEEN THIS CAR tooling around Faribault and parked at the local library. It’s memorable. One-of-a-kind. Definitely photo-worthy. But I never had my Canon DSLR with me when I spotted it. On a recent Saturday I did. I practically flew from the van with my camera upon sighting the colorful car parked along Central Avenue in front of the Paradise Center for the Arts. And then, bonus, the owner strode across the street toward his vehicle as I was snapping frames. He is Michael. No last name given. I didn’t ask. We chatted briefly, enough for me to learn that this former travel industry professional “works to travel.” His words, not mine. 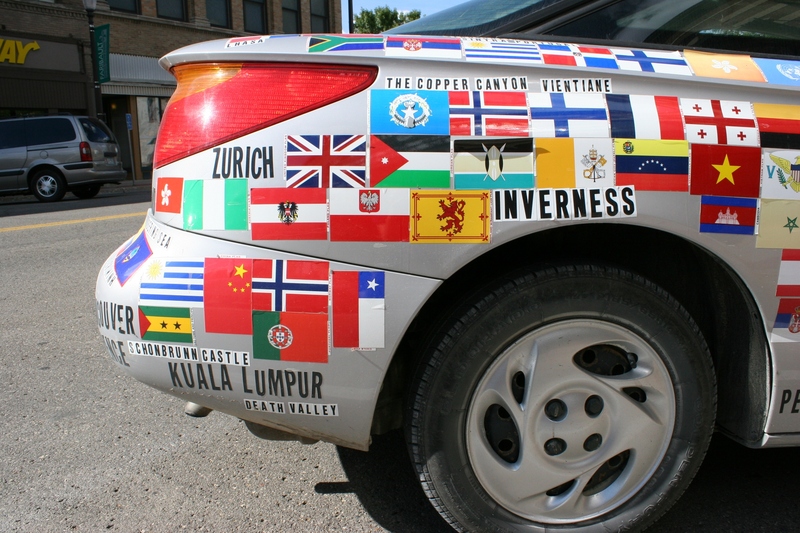 He’s been to about 100 countries. 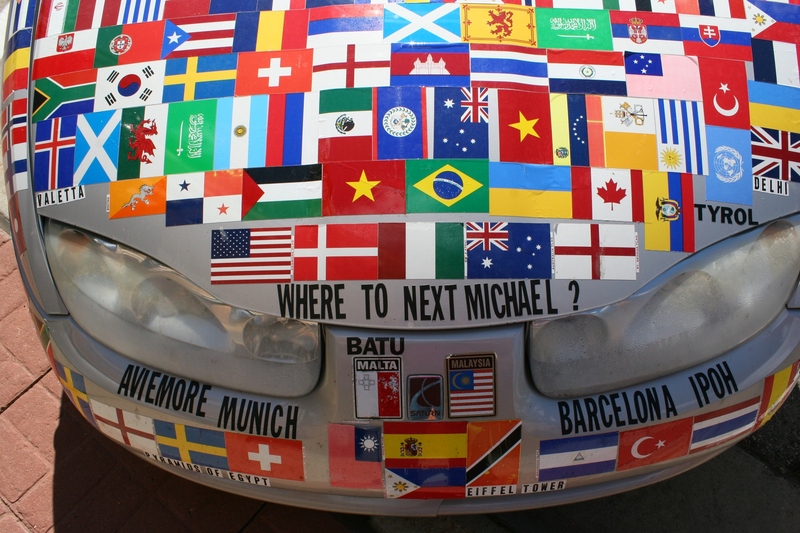 “Try to see it all,” the message adhered to the trunk advises. 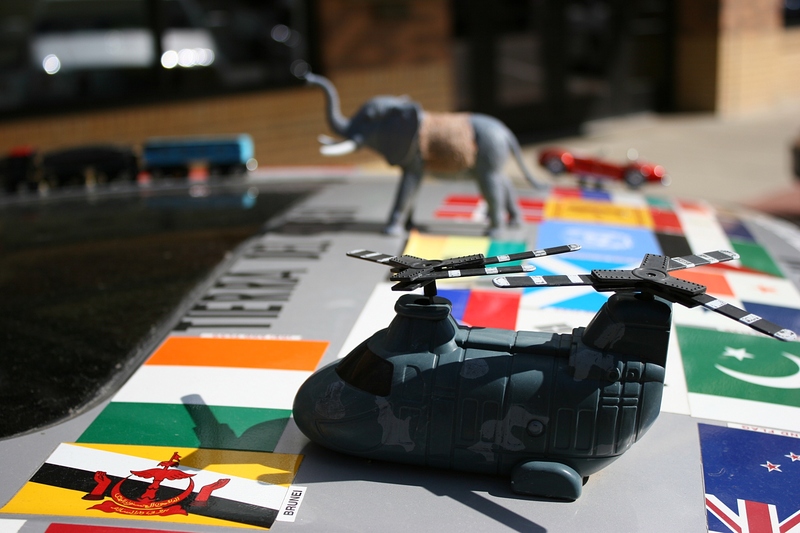 And Michael has, via some interesting, and ordinary, modes of transportation—car, plane, train, helicopter, horse and elephant—documented by toys attached to the car’s roof. 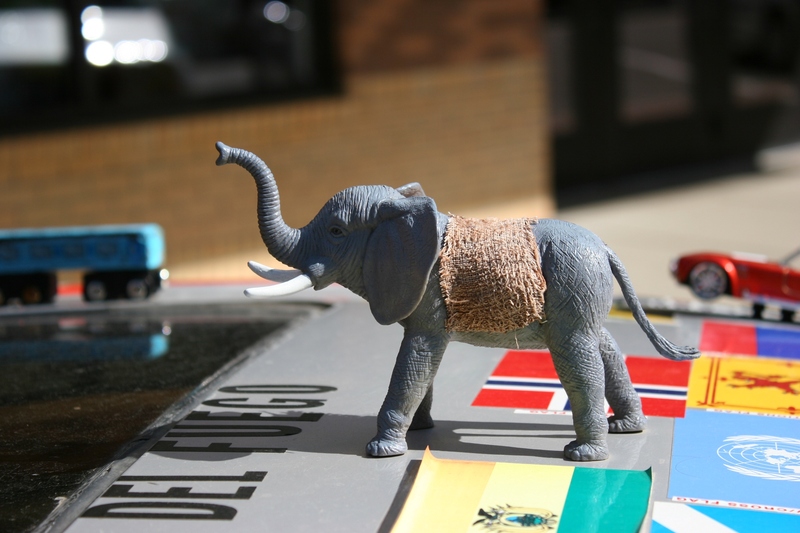 He rode the elephant in Laos or Cambodia. I can’t remember which. Michael, though friendly, seemed reticent to engage in a more in-depth conversation. Maybe he was, like me, on a tight schedule. Or simply reserved, choosing to maintain a level of mystery about himself and his travels. That’s OK.
Perhaps that reveals more about Michael than anything he could have spoken. 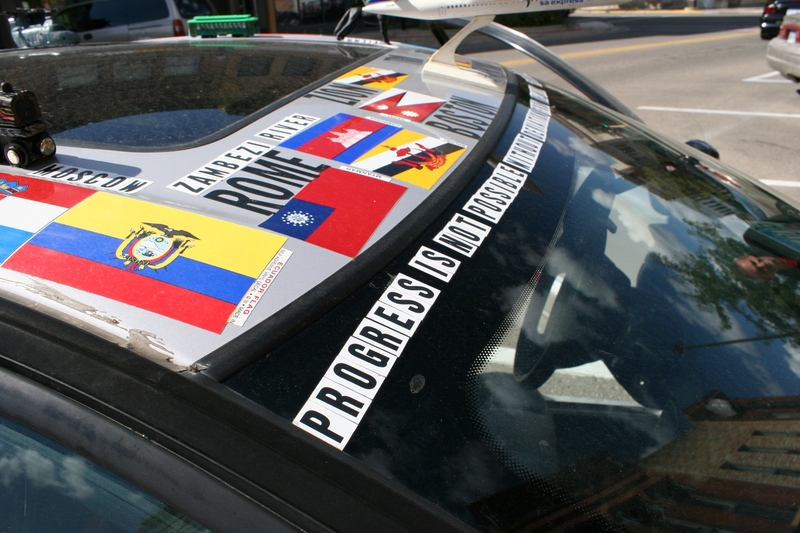 FYI: To read another post about an art car I’ve photographed in Faribault, click here. Then click here to view one I photographed in Northfield. 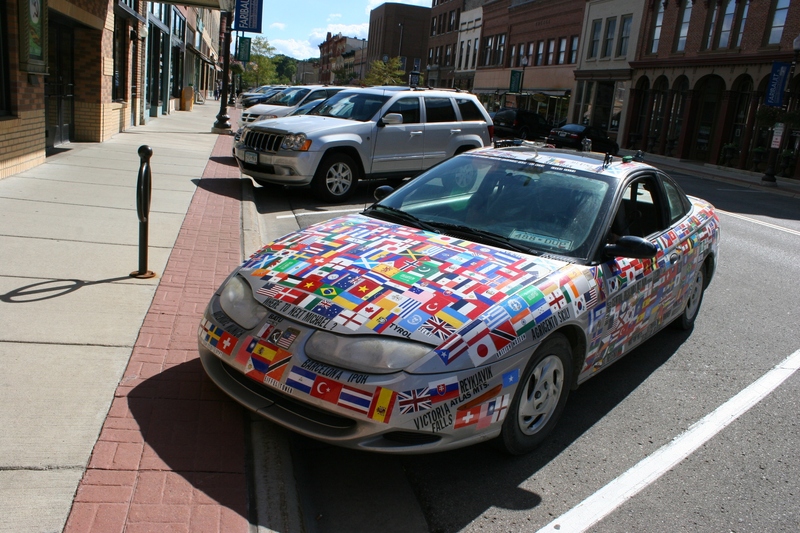 And to view a photo of another art car, photographed by one of my favorite Minnesota documentary photographers, Dan Traun of Red Wing, click here and check out the Sept. 14 entry. MY MOM PAUSED in our conversation. She wondered if she was hearing me right. I had just stated that I thought the chickens beautiful. Not all chickens. But these chickens. She had reason to question my observation. Ever since I was tormented and pecked at and chased by a rooster while growing up on our Minnesota farm, I have disliked chickens. I am afraid of them, of their flapping wings and sharp beaks and talons. But these chickens were different. They are not plain white. And the rooster did not chase me. 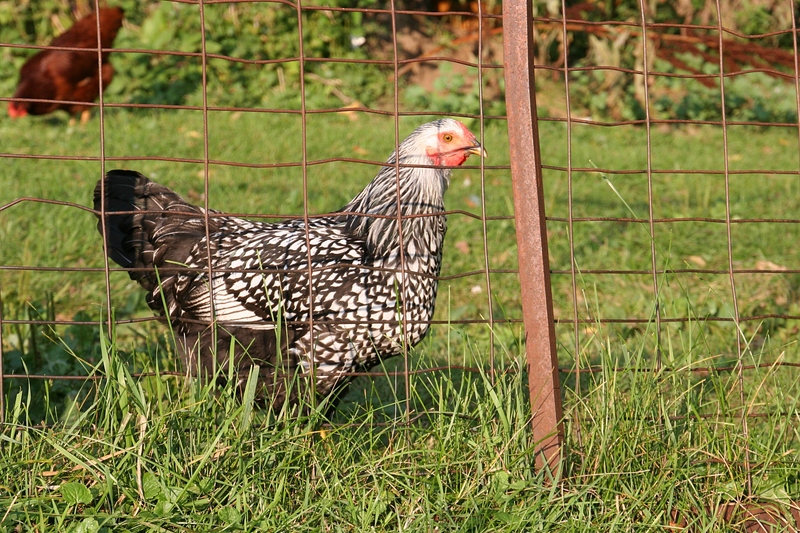 I was able to stand within feet of uncaged multi-colored fowl and appreciate their beauty. Sheen of blue in black feathers. Patterns of black and white. A beautiful buff. Chickens that were actually cute, if a chicken can be truly cute. Even I surprised myself. I was not terrified. I did not scamper away. I drew the line, though, at cuddling the chickens belonging to friends Steve and Joy. Or at being inside a shed with a hen, gentle as she might appear. My trust is not quite that secure. 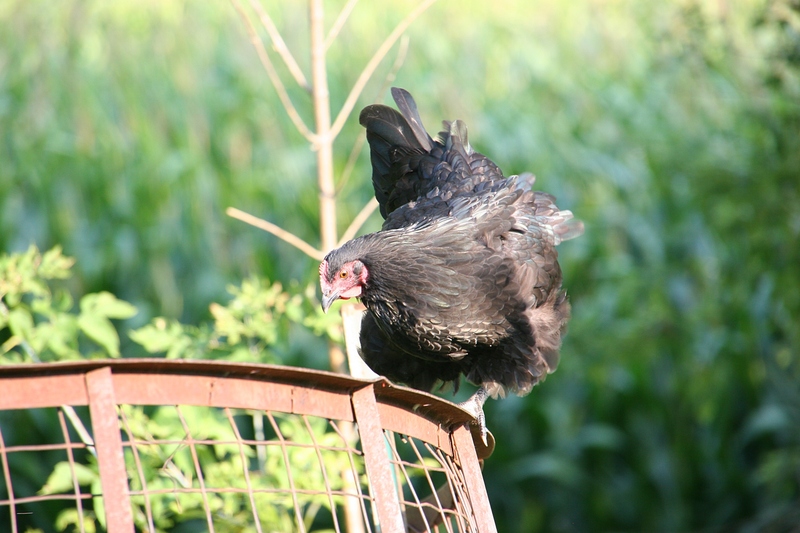 And when a chicken flew onto a fence top, I ended the photo session. She was flapping a little too close for my comfort. 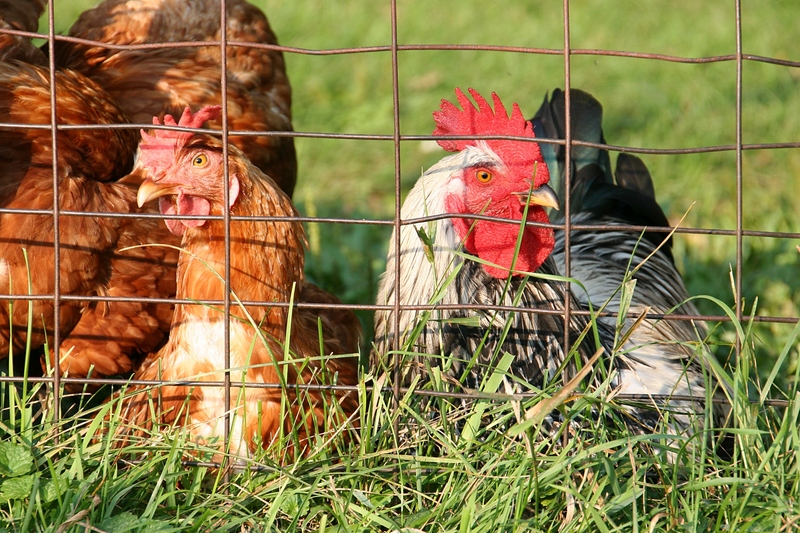 I have memories of unhappy hens in the chicken coop who did not like their eggs stolen. I will never really like chickens. But I am at least beginning to tolerate them. The pretty ones. HOW ABOUT YOU? 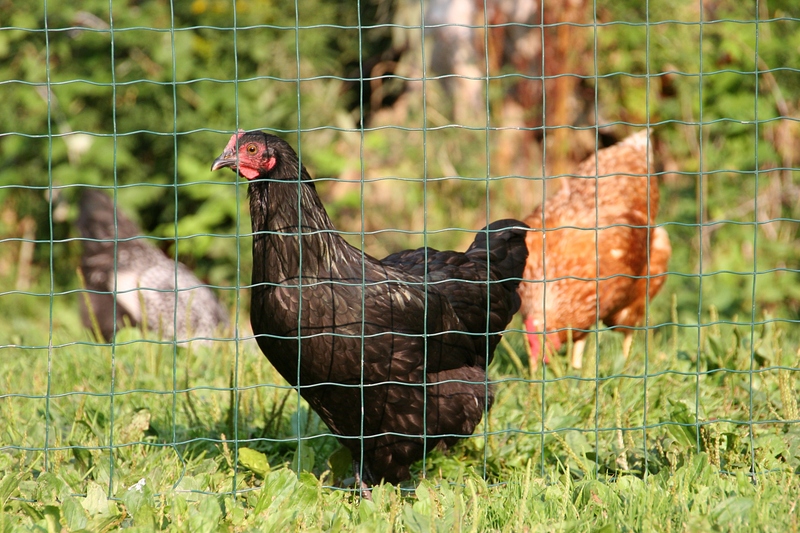 What’s your experience with chickens? 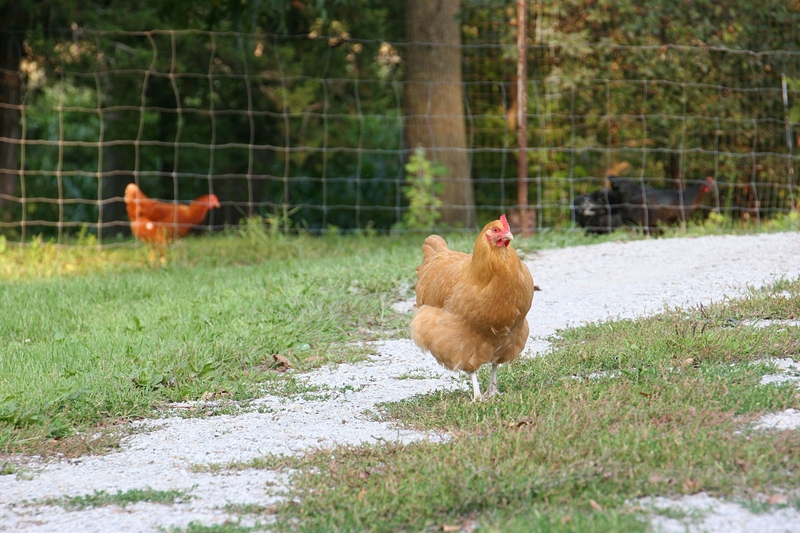 FYI: I first observed my friends’ chickens when they were running around the yard. I did not have my camera with me. But when I visited again, I had my camera. These images were taken then.